Six Evidence Based Behavior Interventions Prior to or Instead of Behavior Plans	Diana Browning Wright Diana Browning Wright, M.S., L.E.P. www.dianabrowningwright.com. 1 Six Evidence Based Behavior Interventions Prior to or Instead of Behavior Plans	Diana Browning Wright Diana Browning Wright, M.S., L.E.P. 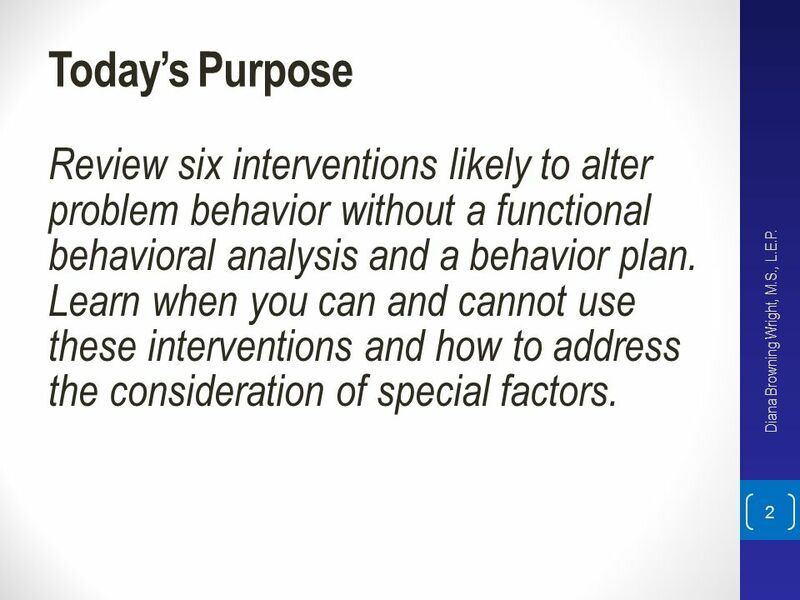 2 Today’s Purpose Review six interventions likely to alter problem behavior without a functional behavioral analysis and a behavior plan. 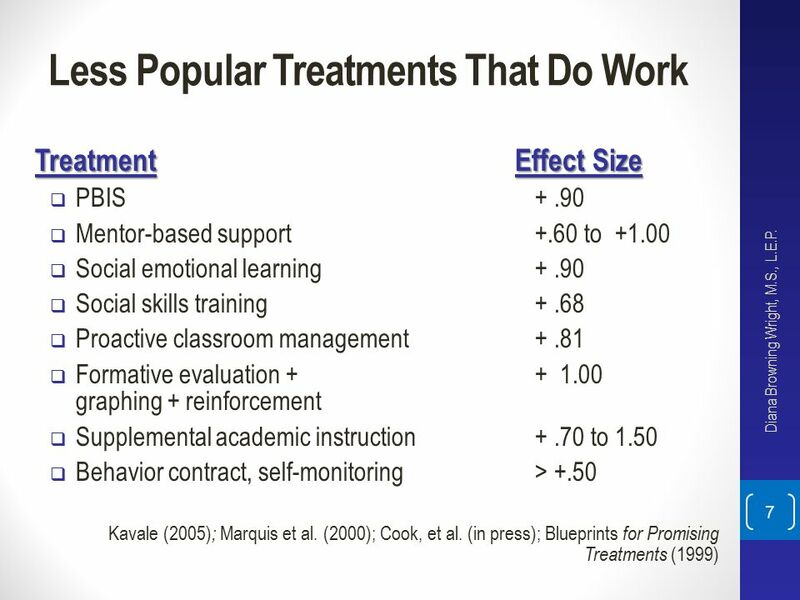 Learn when you can and cannot use these interventions and how to address the consideration of special factors. Diana Browning Wright, M.S., L.E.P. 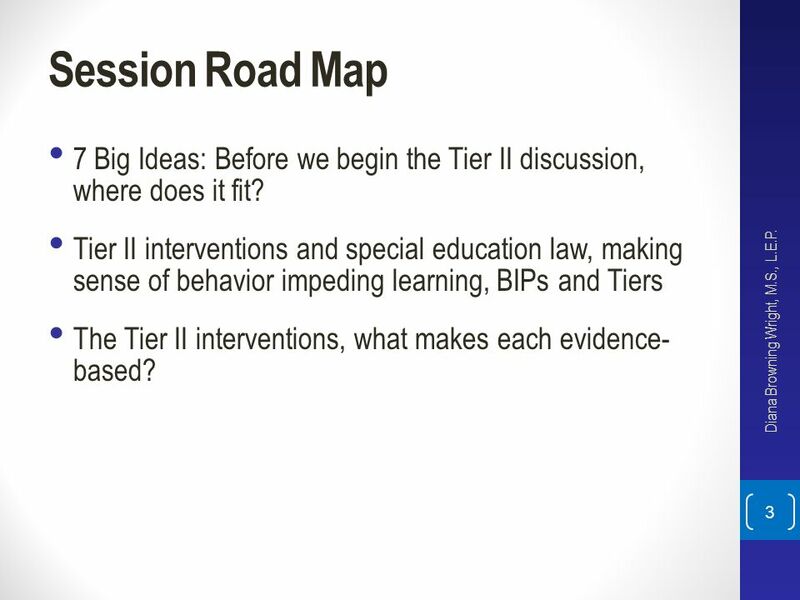 3 Session Road Map 7 Big Ideas: Before we begin the Tier II discussion, where does it fit? 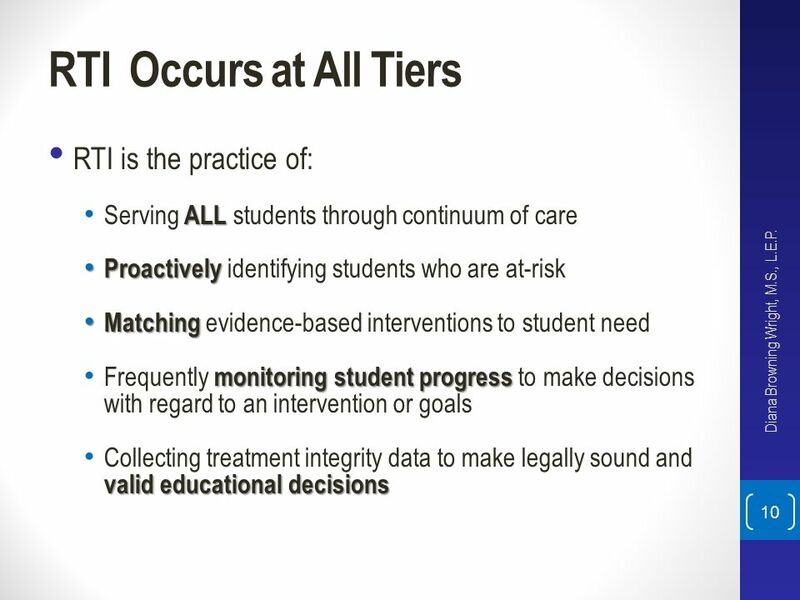 Tier II interventions and special education law, making sense of behavior impeding learning, BIPs and Tiers The Tier II interventions, what makes each evidence- based? Diana Browning Wright, M.S., L.E.P. 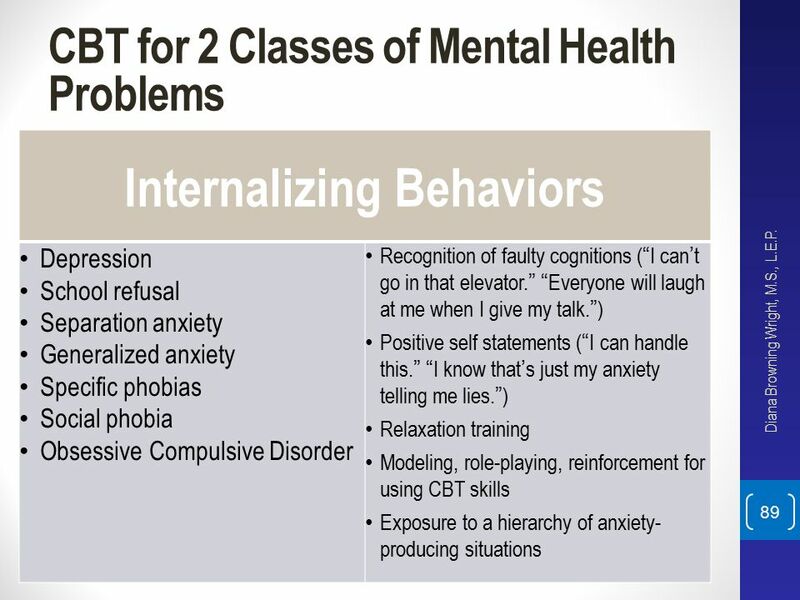 Externalizing Problems Internalizing Problems Oppositional behaviors Conduct problems Disruptive behaviors Hyperactivity/Impulsivity Substance abuse Anxiety Depression Trauma Substance abuse Diana Browning Wright, M.S., L.E.P. 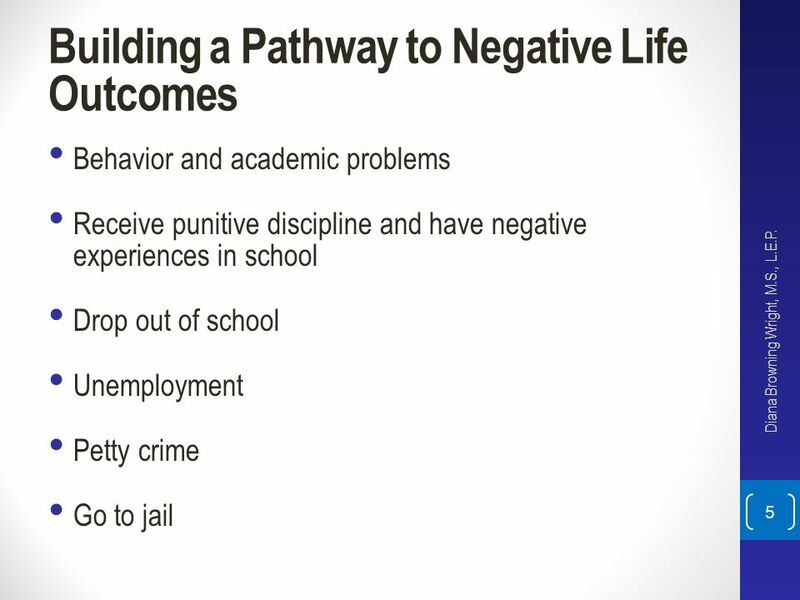 Behavior and academic problems Receive punitive discipline and have negative experiences in school Drop out of school Unemployment Petty crime Go to jail Diana Browning Wright, M.S., L.E.P. 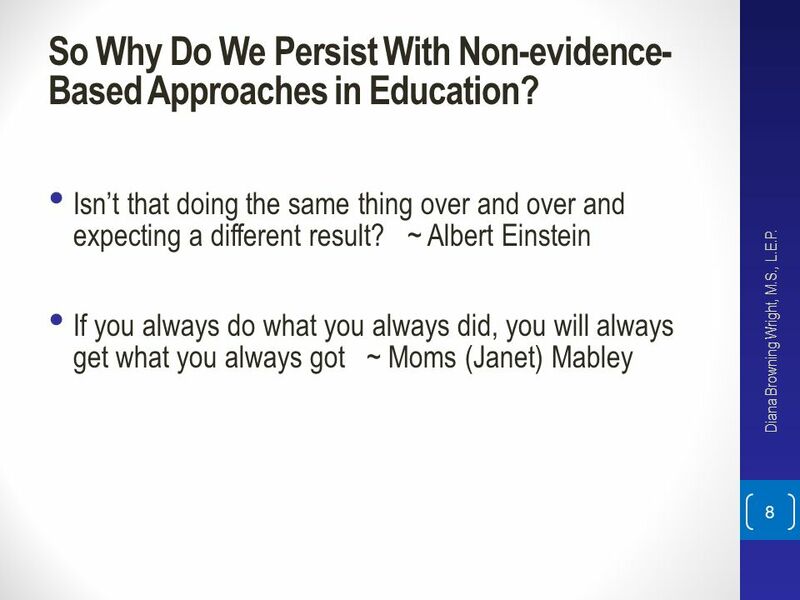 8 So Why Do We Persist With Non-evidence- Based Approaches in Education? 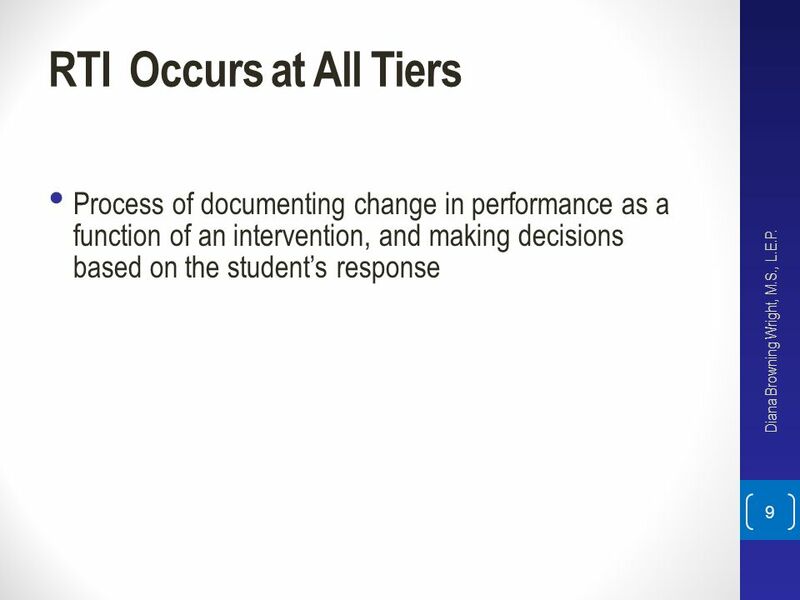 9 RTI Occurs at All Tiers Process of documenting change in performance as a function of an intervention, and making decisions based on the student’s response Diana Browning Wright, M.S., L.E.P. Serving ALL students through continuum of care Proactively identifying students who are at-risk Matching evidence-based interventions to student need Frequently monitoring student progress to make decisions with regard to an intervention or goals Collecting treatment integrity data to make legally sound and valid educational decisions Diana Browning Wright, M.S., L.E.P. 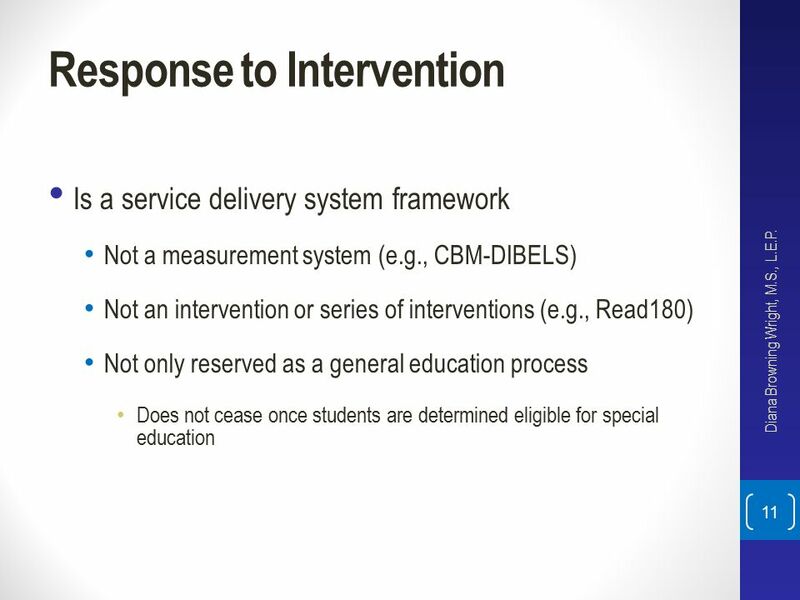 Is a service delivery system framework Not a measurement system (e.g., CBM-DIBELS) Not an intervention or series of interventions (e.g., Read180) Not only reserved as a general education process Does not cease once students are determined eligible for special education Diana Browning Wright, M.S., L.E.P. 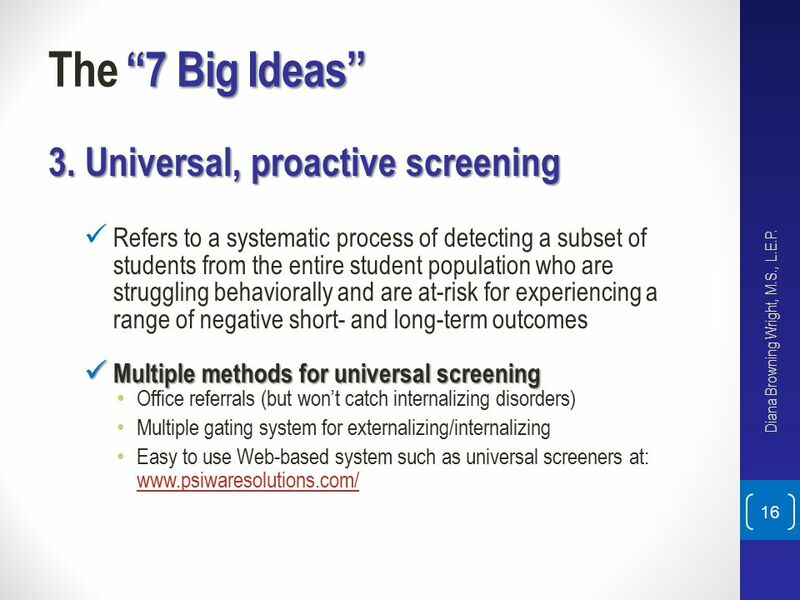 The “7 Big Ideas” 1. 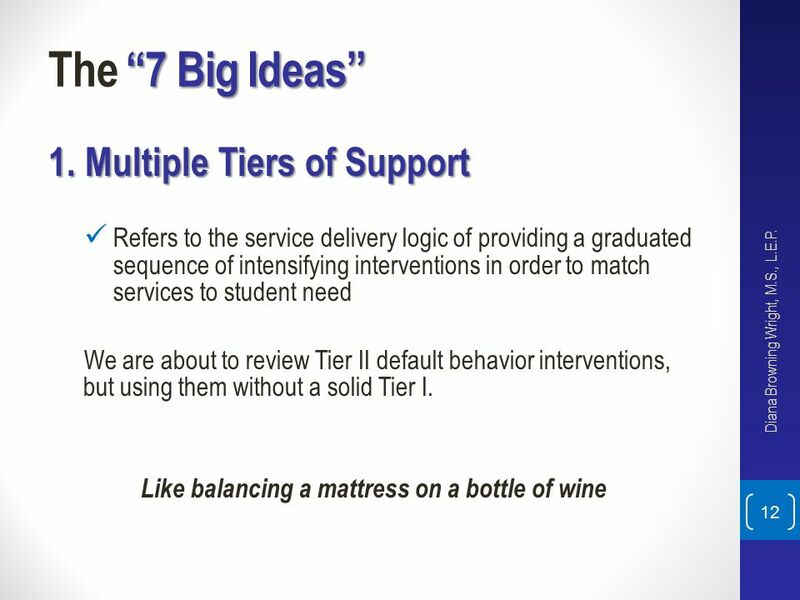 Multiple Tiers of Support Refers to the service delivery logic of providing a graduated sequence of intensifying interventions in order to match services to student need We are about to review Tier II default behavior interventions, but using them without a solid Tier I. Like balancing a mattress on a bottle of wine Diana Browning Wright, M.S., L.E.P. 14 The “7 Big Ideas” 2. 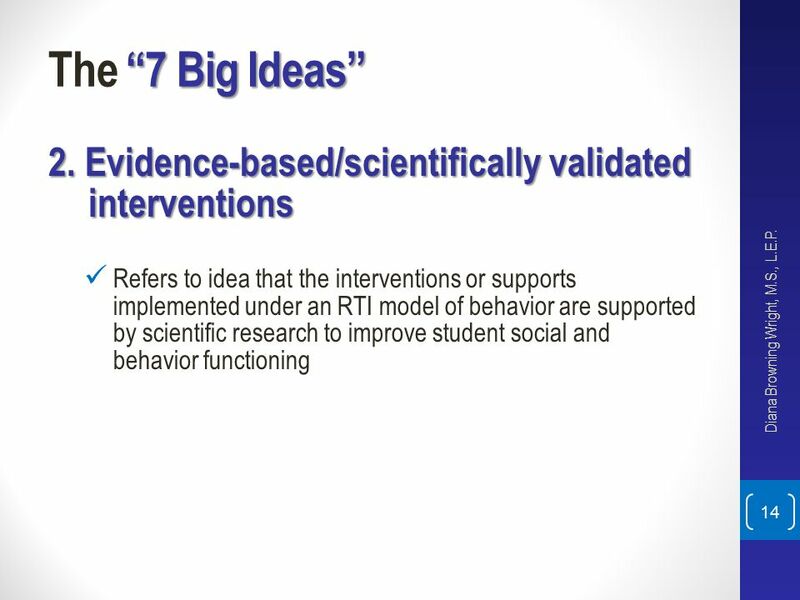 Evidence-based/scientifically validated interventions Refers to idea that the interventions or supports implemented under an RTI model of behavior are supported by scientific research to improve student social and behavior functioning Diana Browning Wright, M.S., L.E.P. 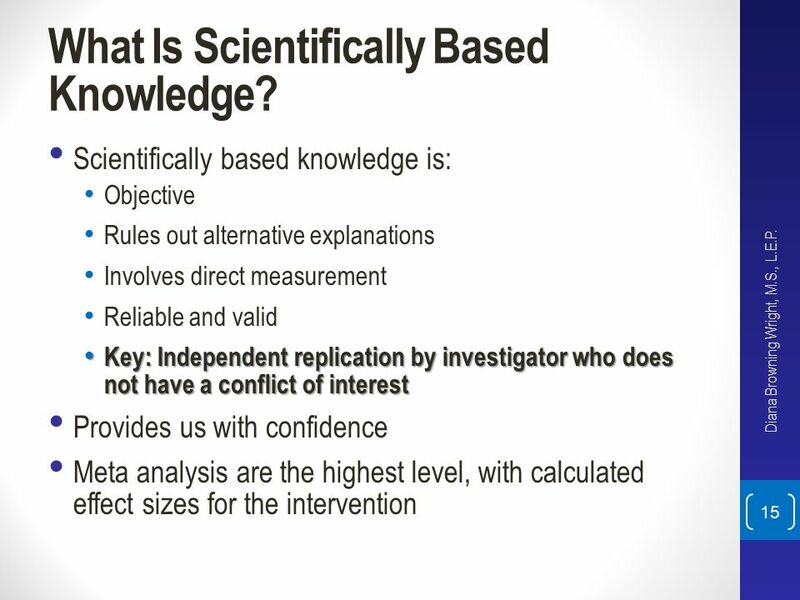 15 What Is Scientifically Based Knowledge? 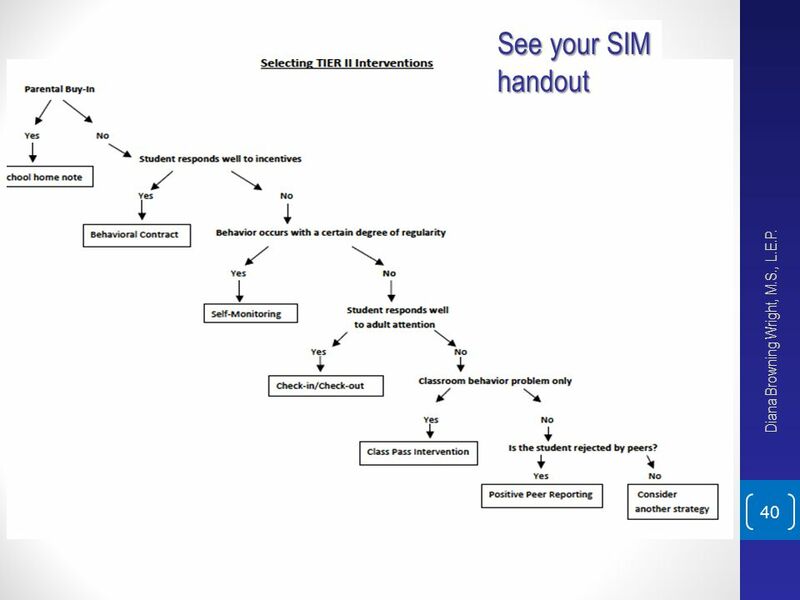 Refers to a systematic process of detecting a subset of students from the entire student population who are struggling behaviorally and are at-risk for experiencing a range of negative short- and long-term outcomes Multiple methods for universal screening Office referrals (but won’t catch internalizing disorders) Multiple gating system for externalizing/internalizing Easy to use Web-based system such as universal screeners at: Diana Browning Wright, M.S., L.E.P. 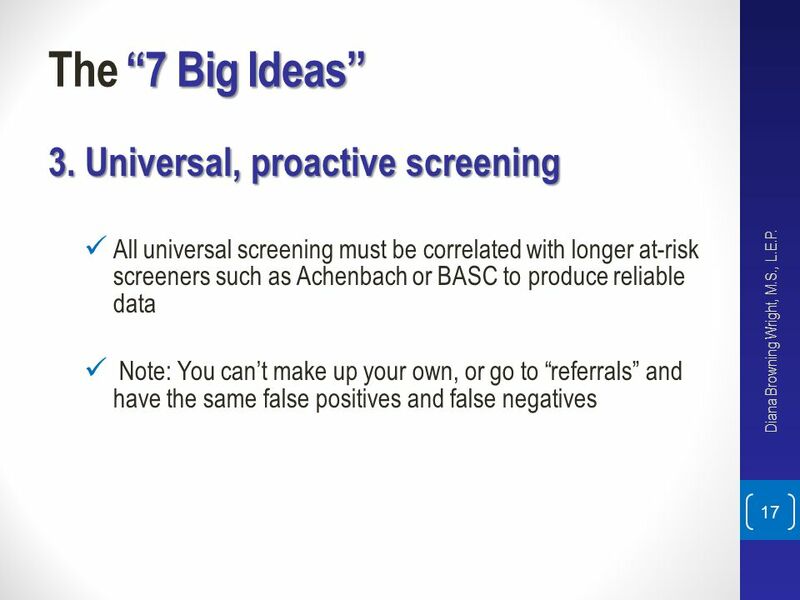 All universal screening must be correlated with longer at-risk screeners such as Achenbach or BASC to produce reliable data Note: You can’t make up your own, or go to “referrals” and have the same false positives and false negatives Diana Browning Wright, M.S., L.E.P. Who wants “wait-to-fail” model of service delivery? 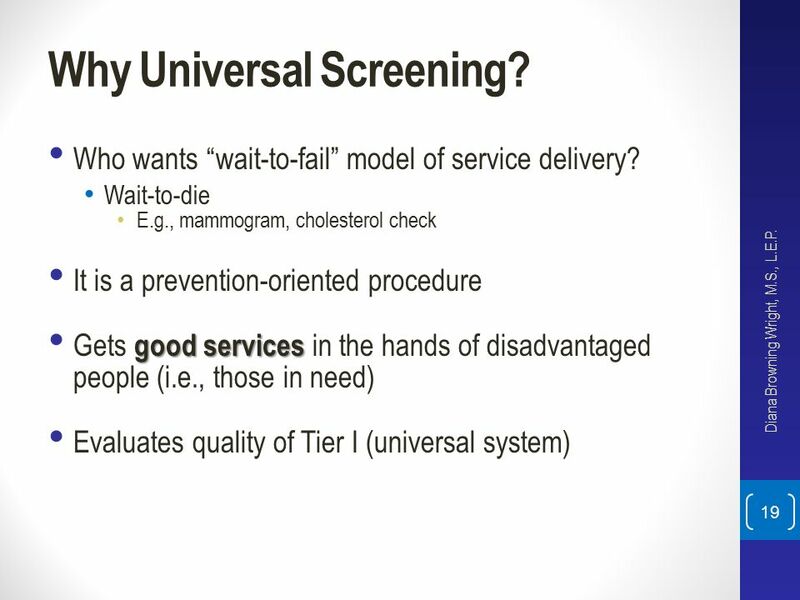 Wait-to-die E.g., mammogram, cholesterol check It is a prevention-oriented procedure Gets good services in the hands of disadvantaged people (i.e., those in need) Evaluates quality of Tier I (universal system) Diana Browning Wright, M.S., L.E.P. 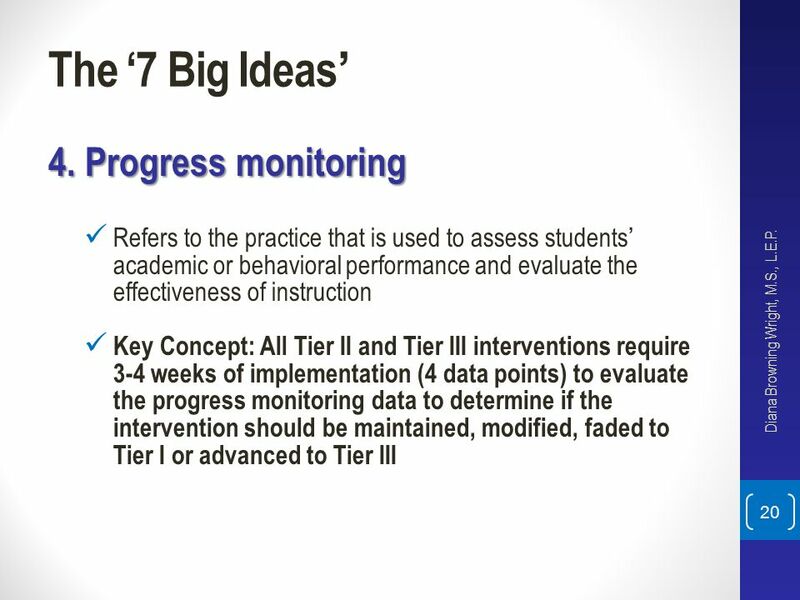 Refers to the practice that is used to assess students’ academic or behavioral performance and evaluate the effectiveness of instruction Key Concept: All Tier II and Tier III interventions require 3-4 weeks of implementation (4 data points) to evaluate the progress monitoring data to determine if the intervention should be maintained, modified, faded to Tier I or advanced to Tier III Diana Browning Wright, M.S., L.E.P. 21 What Are We Looking for in a Progress Monitoring Tool? 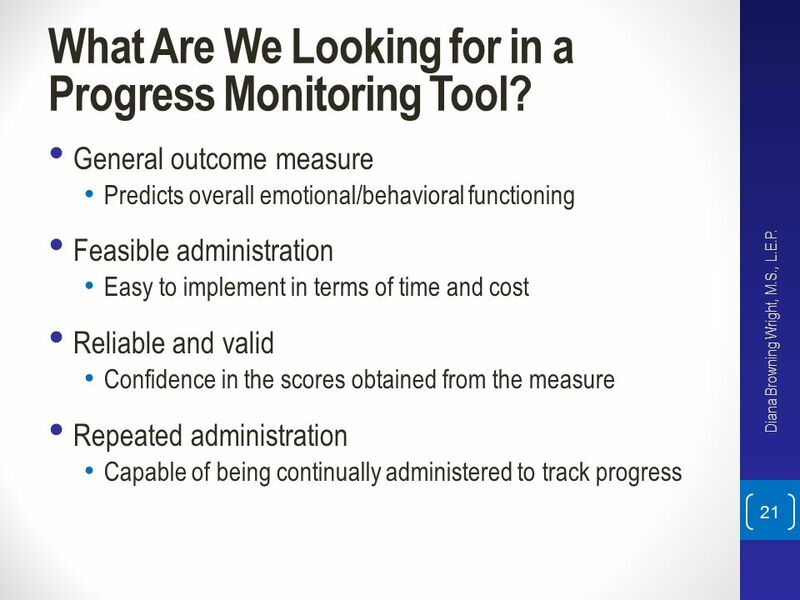 General outcome measure Predicts overall emotional/behavioral functioning Feasible administration Easy to implement in terms of time and cost Reliable and valid Confidence in the scores obtained from the measure Repeated administration Capable of being continually administered to track progress Diana Browning Wright, M.S., L.E.P. 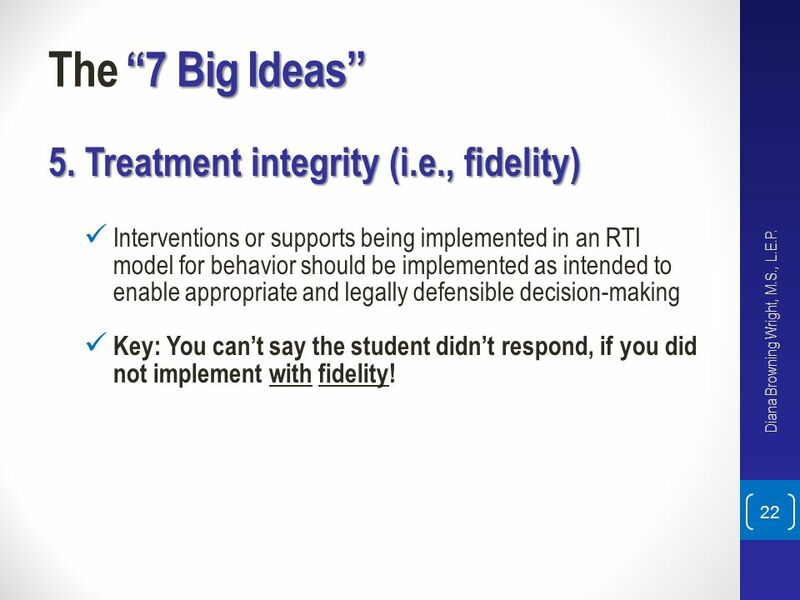 Interventions or supports being implemented in an RTI model for behavior should be implemented as intended to enable appropriate and legally defensible decision-making Key: You can’t say the student didn’t respond, if you did not implement with fidelity! Diana Browning Wright, M.S., L.E.P. 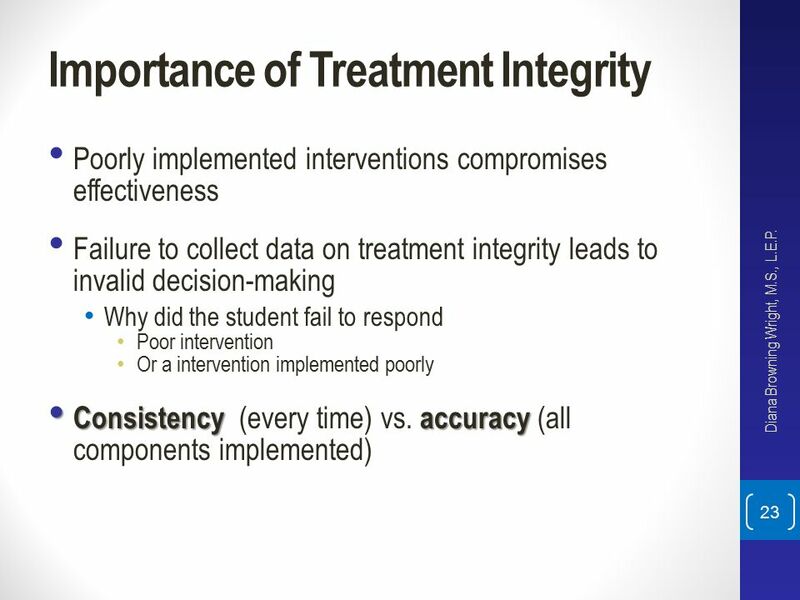 Poorly implemented interventions compromises effectiveness Failure to collect data on treatment integrity leads to invalid decision-making Why did the student fail to respond Poor intervention Or a intervention implemented poorly Consistency (every time) vs. accuracy (all components implemented) Diana Browning Wright, M.S., L.E.P. 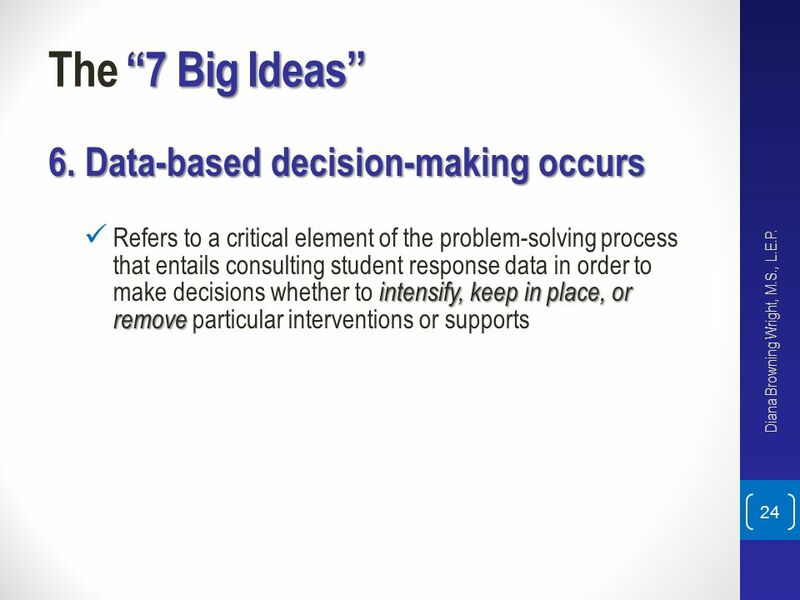 Refers to a critical element of the problem-solving process that entails consulting student response data in order to make decisions whether to intensify, keep in place, or remove particular interventions or supports Diana Browning Wright, M.S., L.E.P. 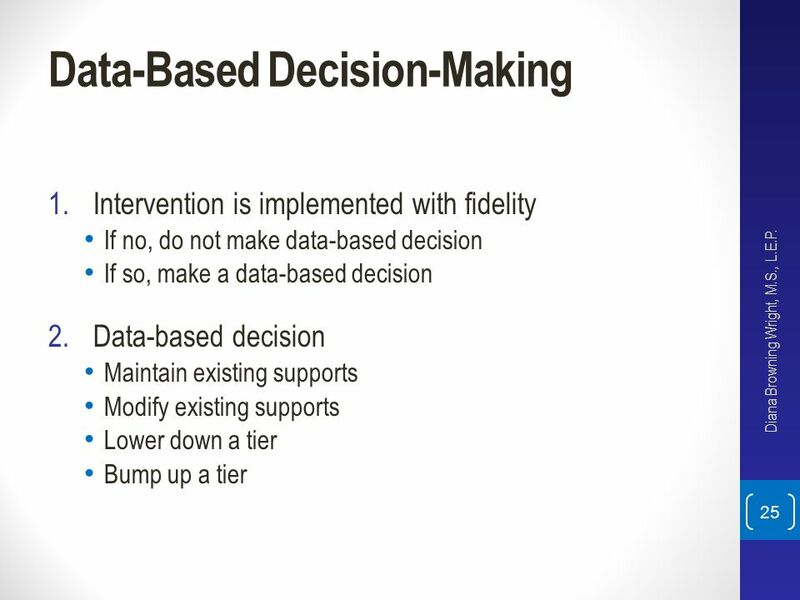 Intervention is implemented with fidelity If no, do not make data-based decision If so, make a data-based decision Data-based decision Maintain existing supports Modify existing supports Lower down a tier Bump up a tier Diana Browning Wright, M.S., L.E.P. 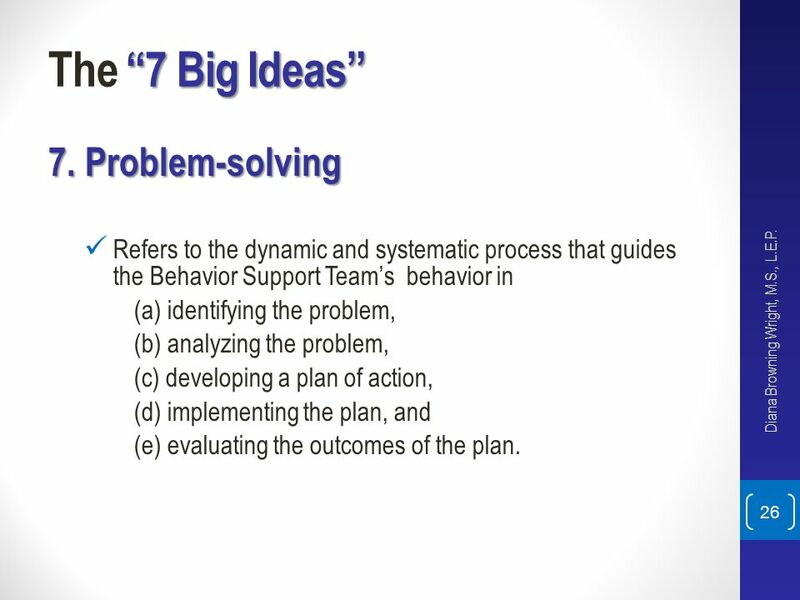 Refers to the dynamic and systematic process that guides the Behavior Support Team’s behavior in (a) identifying the problem, (b) analyzing the problem, (c) developing a plan of action, (d) implementing the plan, and (e) evaluating the outcomes of the plan. Diana Browning Wright, M.S., L.E.P. 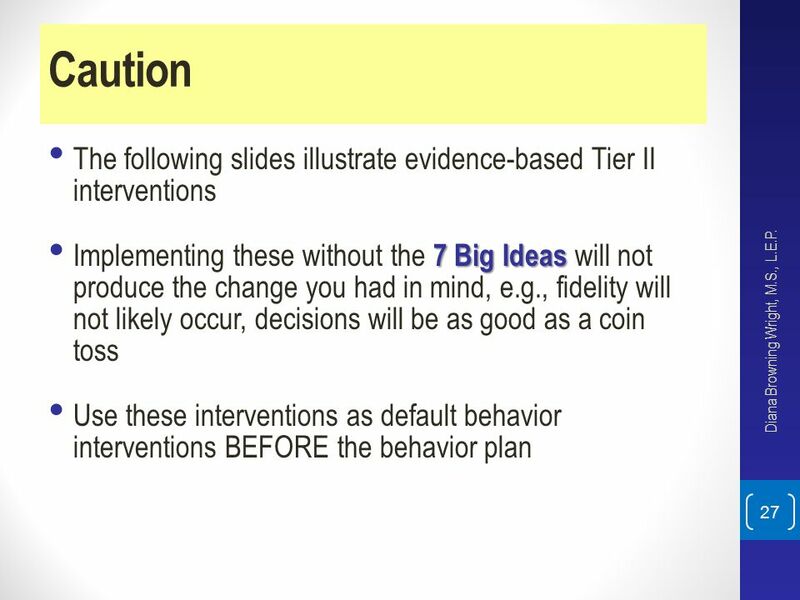 27 Caution The following slides illustrate evidence-based Tier II interventions Implementing these without the 7 Big Ideas will not produce the change you had in mind, e.g., fidelity will not likely occur, decisions will be as good as a coin toss Use these interventions as default behavior interventions BEFORE the behavior plan Diana Browning Wright, M.S., L.E.P. 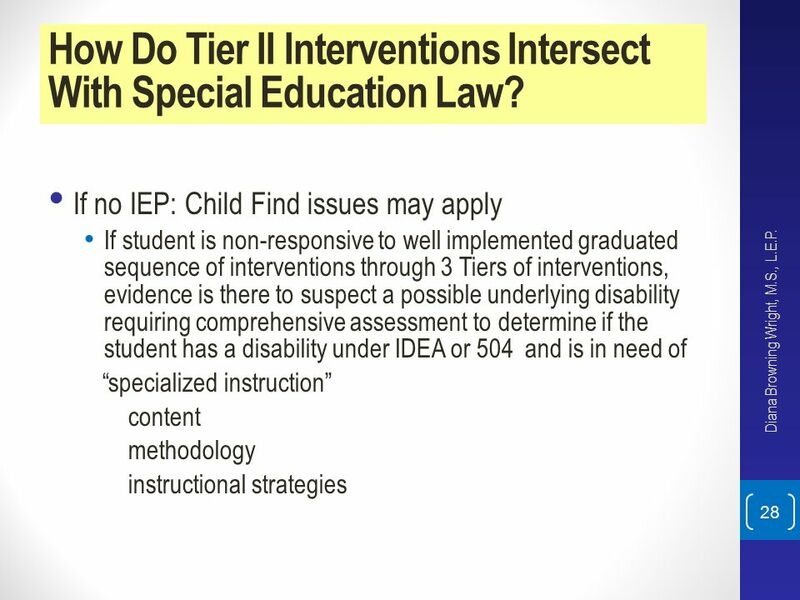 28 How Do Tier II Interventions Intersect With Special Education Law? If no IEP: Child Find issues may apply If student is non-responsive to well implemented graduated sequence of interventions through 3 Tiers of interventions, evidence is there to suspect a possible underlying disability requiring comprehensive assessment to determine if the student has a disability under IDEA or 504 and is in need of “specialized instruction” content methodology instructional strategies Diana Browning Wright, M.S., L.E.P. 29 How Does This Intersect With Special Education Law? 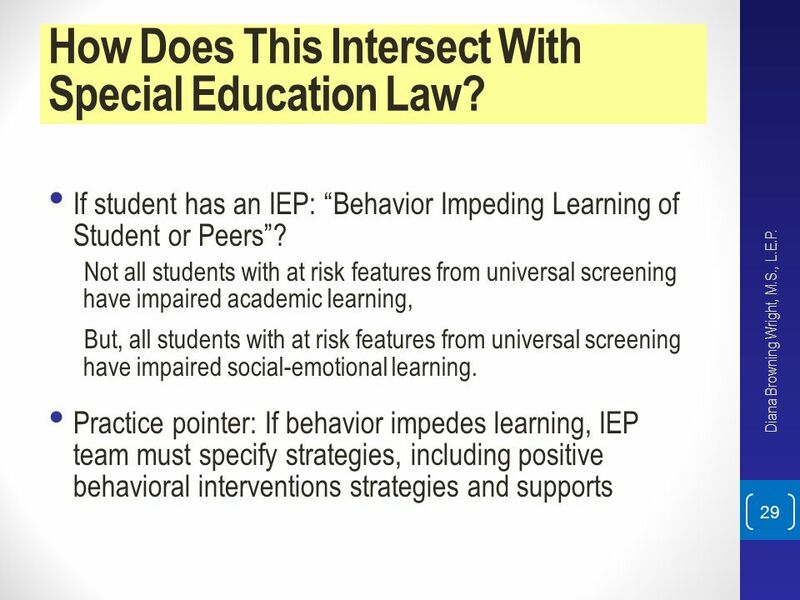 If student has an IEP: “Behavior Impeding Learning of Student or Peers”? 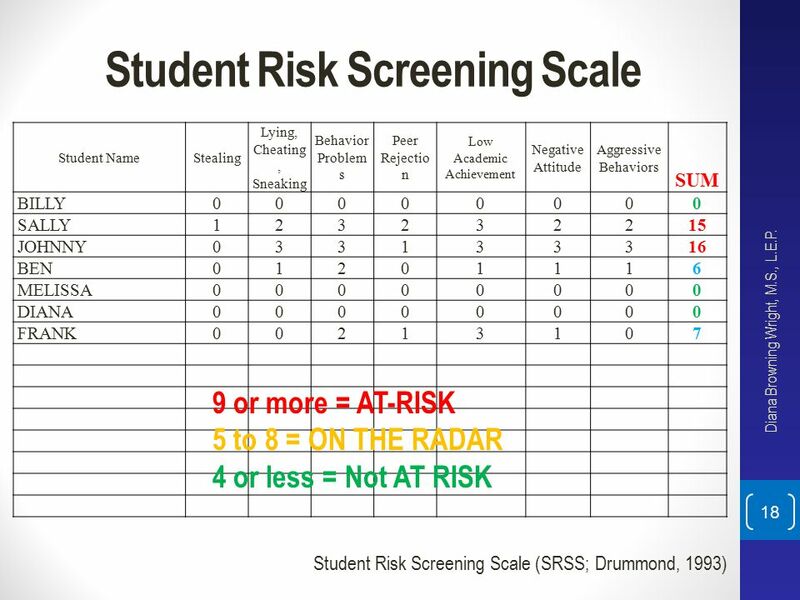 Not all students with at risk features from universal screening have impaired academic learning, But, all students with at risk features from universal screening have impaired social-emotional learning. 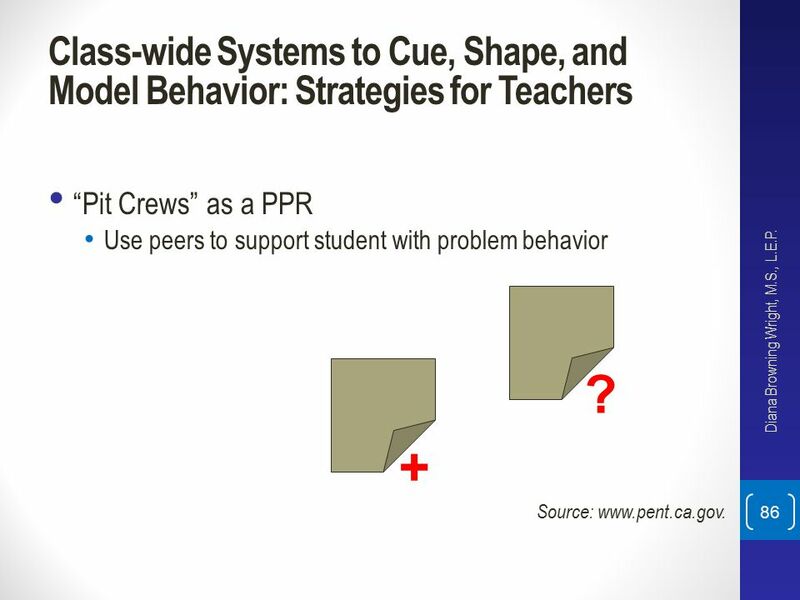 Practice pointer: If behavior impedes learning, IEP team must specify strategies, including positive behavioral interventions strategies and supports Diana Browning Wright, M.S., L.E.P. 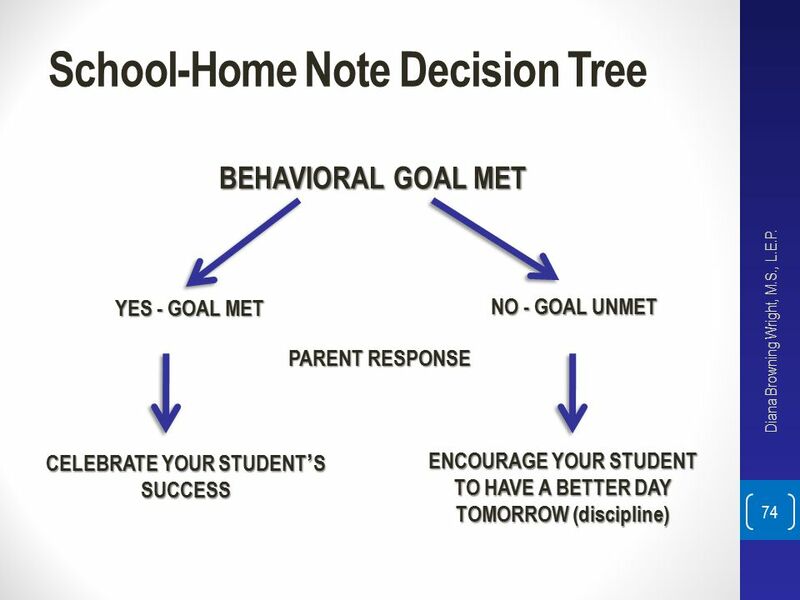 Determine if behavior impedes learning Yes, Maybe, or No If yes, specify Tier II supports in the IEP, establish monitoring frequency and write a goal (4-week decision points!) 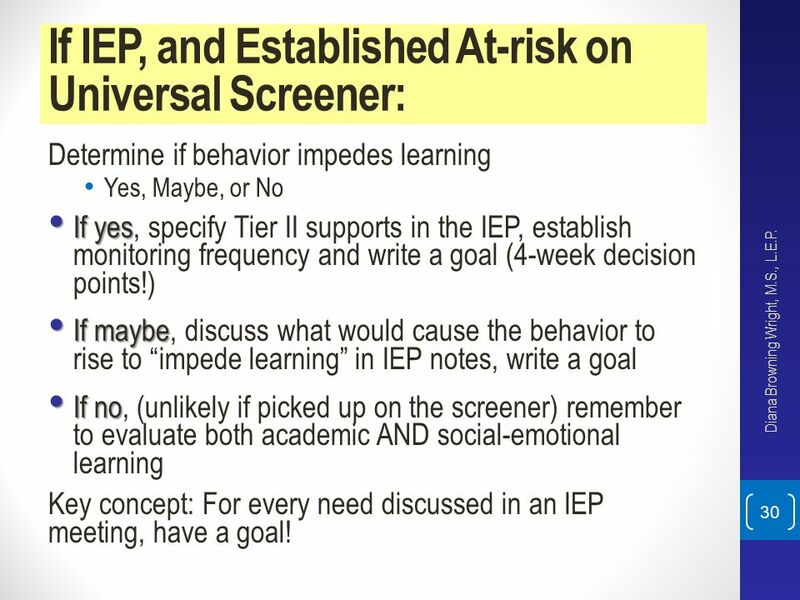 If maybe, discuss what would cause the behavior to rise to “impede learning” in IEP notes, write a goal If no, (unlikely if picked up on the screener) remember to evaluate both academic AND social-emotional learning Key concept: For every need discussed in an IEP meeting, have a goal! Diana Browning Wright, M.S., L.E.P. 31 But Wait a Minute! Doesn’t every behavior that impedes learning need a BIP? 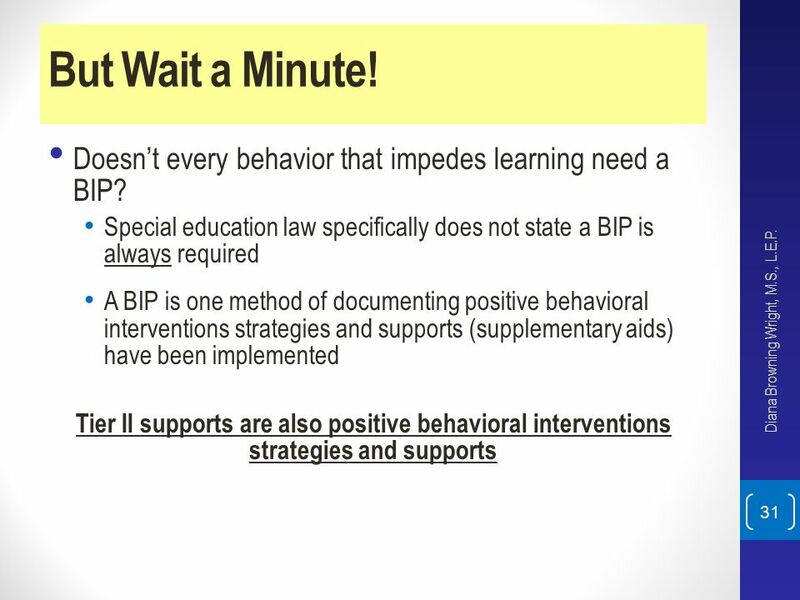 Special education law specifically does not state a BIP is always required A BIP is one method of documenting positive behavioral interventions strategies and supports (supplementary aids) have been implemented Tier II supports are also positive behavioral interventions strategies and supports Diana Browning Wright, M.S., L.E.P. 32 What About Students With More Than 10 Days of Suspension and Risk on the Universal Screener? 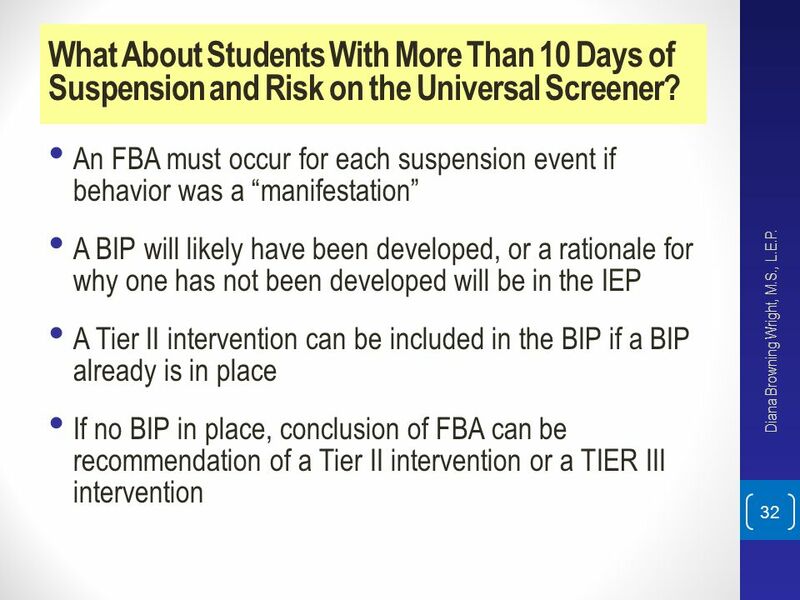 An FBA must occur for each suspension event if behavior was a “manifestation” A BIP will likely have been developed, or a rationale for why one has not been developed will be in the IEP A Tier II intervention can be included in the BIP if a BIP already is in place If no BIP in place, conclusion of FBA can be recommendation of a Tier II intervention or a TIER III intervention Diana Browning Wright, M.S., L.E.P. 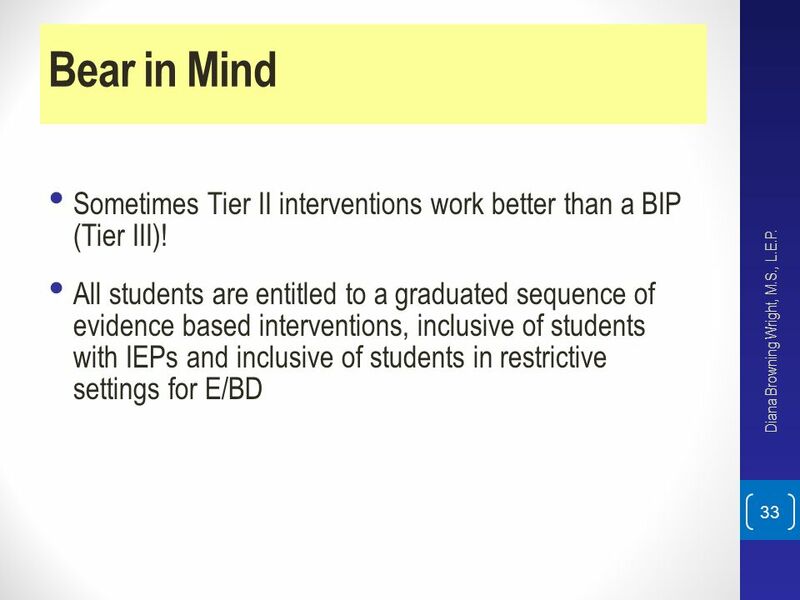 33 Bear in Mind Sometimes Tier II interventions work better than a BIP (Tier III)! 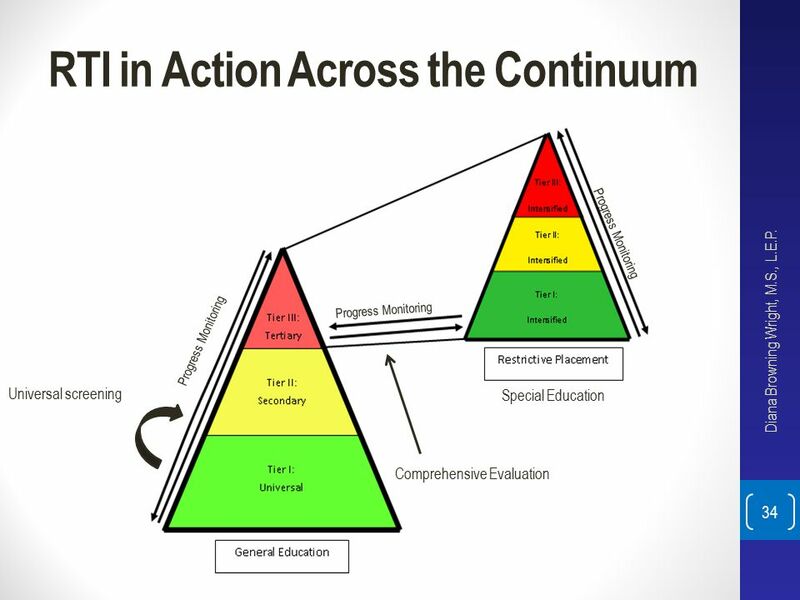 All students are entitled to a graduated sequence of evidence based interventions, inclusive of students with IEPs and inclusive of students in restrictive settings for E/BD Diana Browning Wright, M.S., L.E.P. 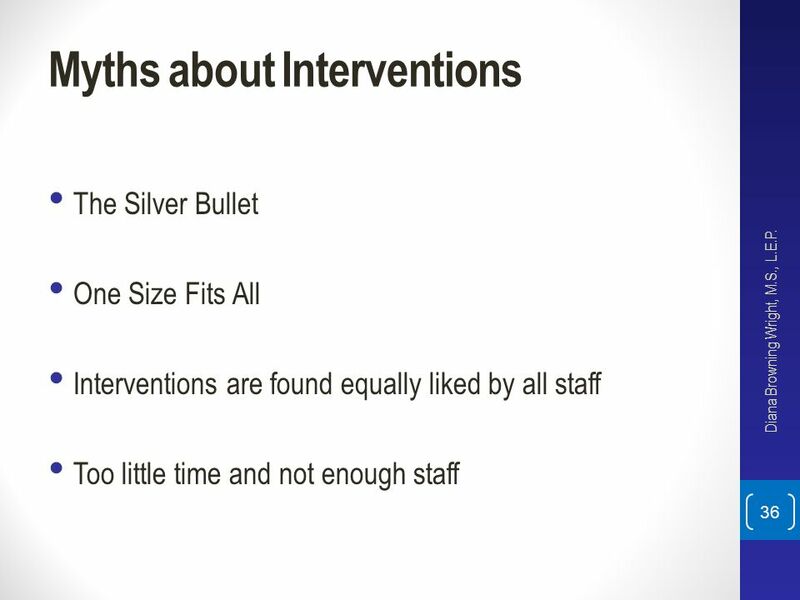 The Silver Bullet One Size Fits All Interventions are found equally liked by all staff Too little time and not enough staff Diana Browning Wright, M.S., L.E.P. 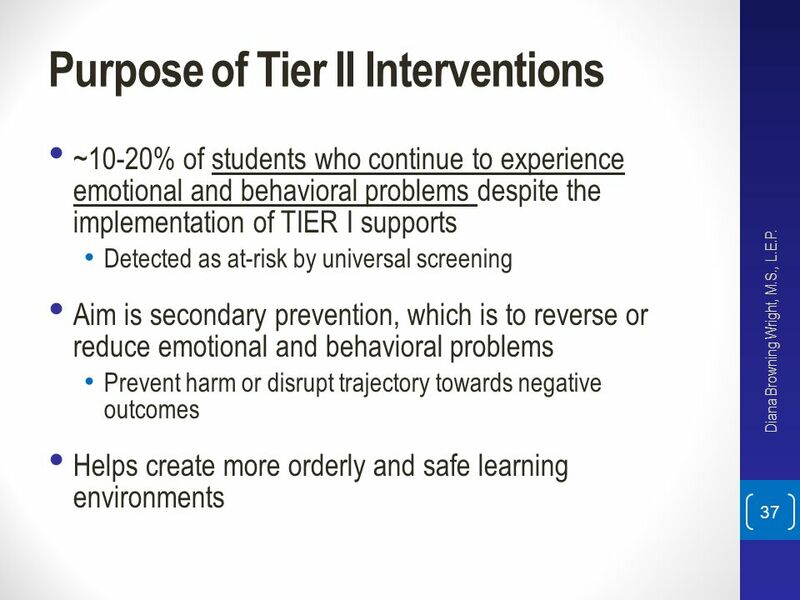 ~10-20% of students who continue to experience emotional and behavioral problems despite the implementation of TIER I supports Detected as at-risk by universal screening Aim is secondary prevention, which is to reverse or reduce emotional and behavioral problems Prevent harm or disrupt trajectory towards negative outcomes Helps create more orderly and safe learning environments Diana Browning Wright, M.S., L.E.P. 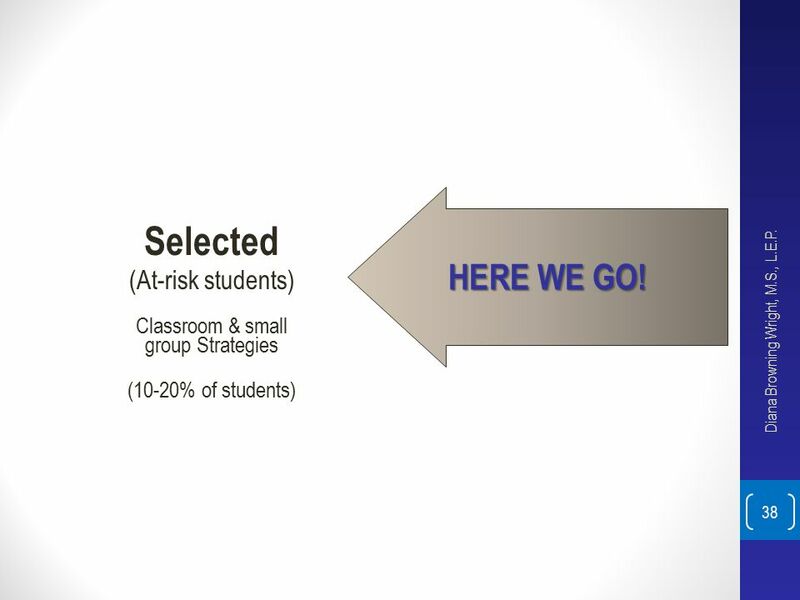 group Strategies (10-20% of students) HERE WE GO! Diana Browning Wright, M.S., L.E.P. 1. 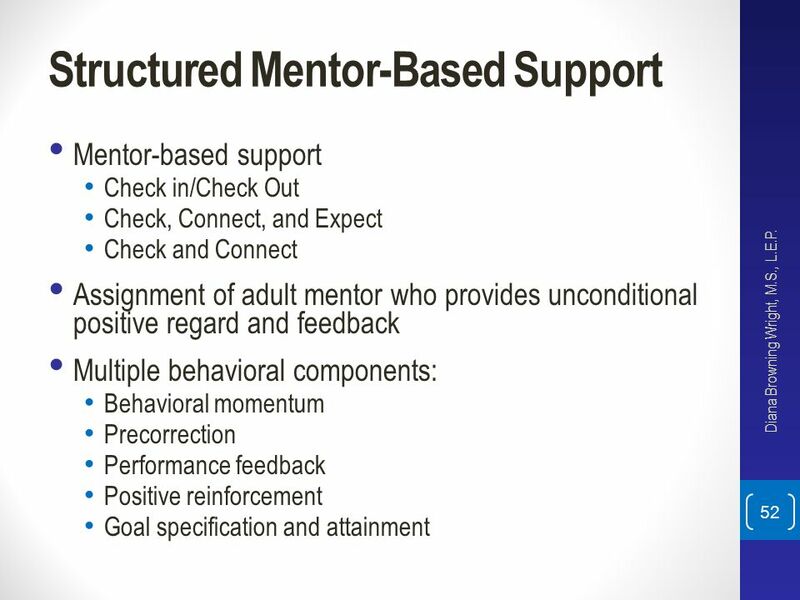 Mentor-based support* e.g., Check in/Check out 2. 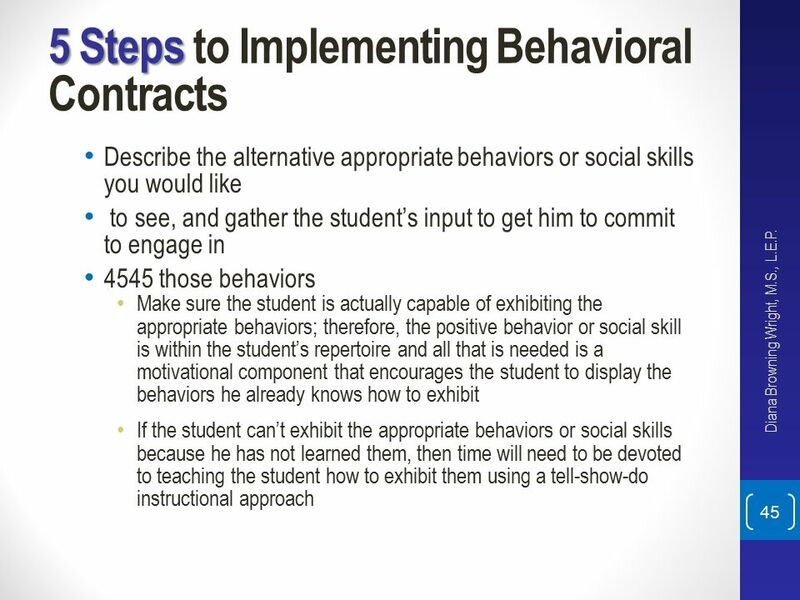 Behavior contracting* 3. 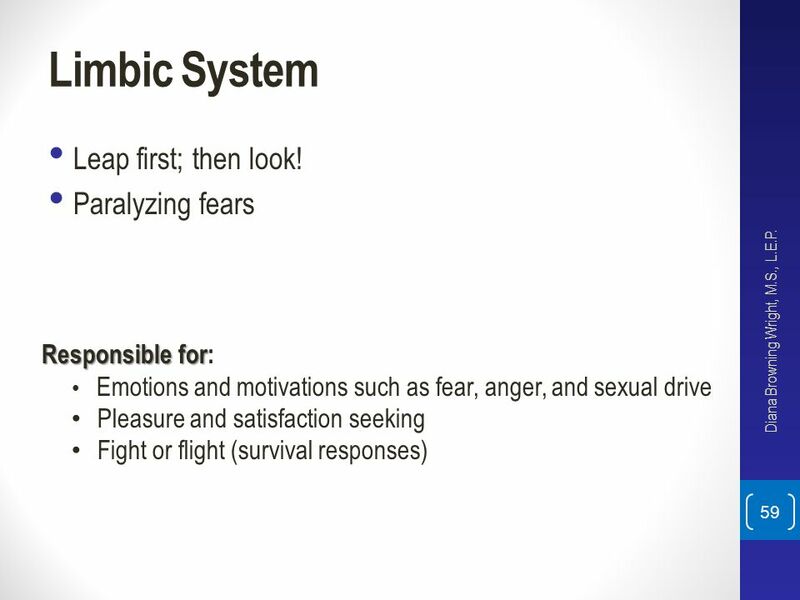 Self-monitoring* 4. 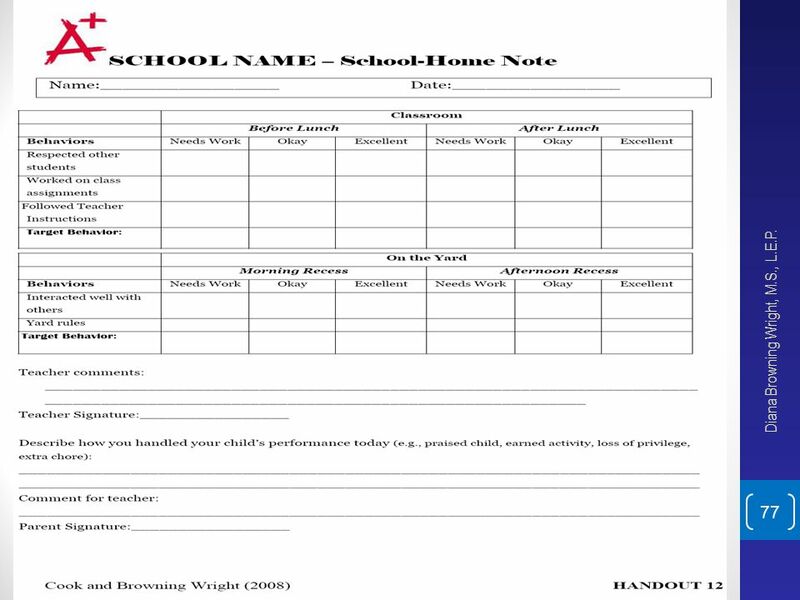 School-home note system* Dependent group contingency (one student earns for all) First Step to Success Choice-making Progress monitoring combined with rewarding goal attainment* 5. 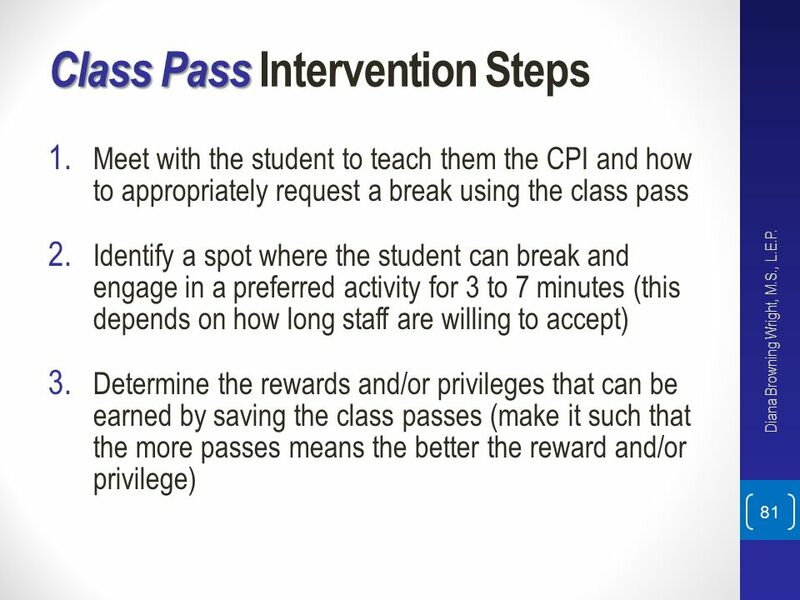 Class pass intervention* 6. 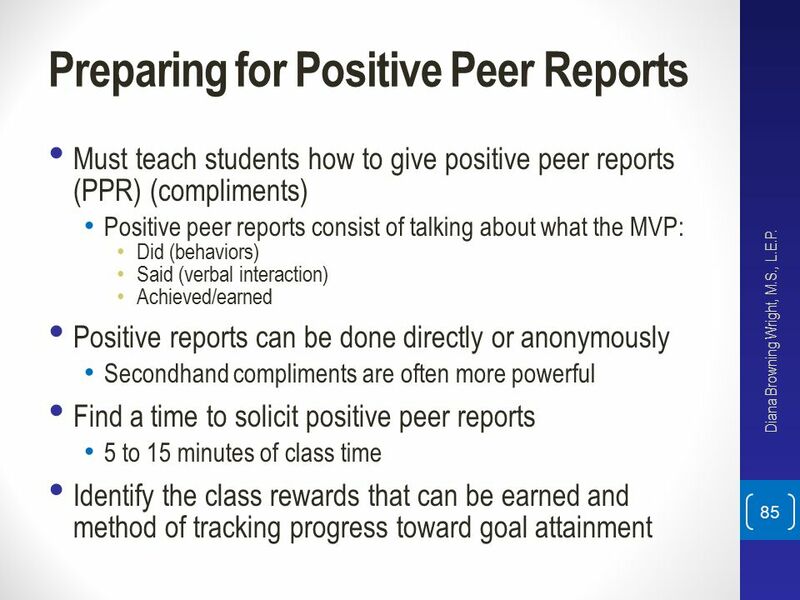 Positive peer reporting* Academic intervention to address skill deficit Noncontingent reinforcement Small group social-emotional learning* Small group social skills training Diana Browning Wright, M.S., L.E.P. 40 See your SIM handout Diana Browning Wright, M.S., L.E.P. This graphic was made by Clay Cook, but we both use in our joint work, sometimes He makes a graphic, sometimes I do. Do you want copyright release then? 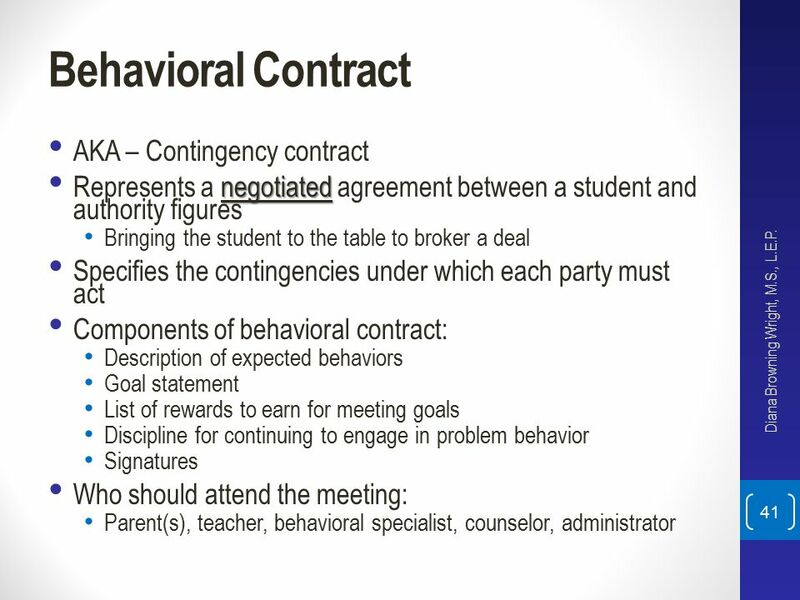 Represents a negotiated agreement between a student and authority figures Bringing the student to the table to broker a deal Specifies the contingencies under which each party must act Components of behavioral contract: Description of expected behaviors Goal statement List of rewards to earn for meeting goals Discipline for continuing to engage in problem behavior Signatures Who should attend the meeting: Parent(s), teacher, behavioral specialist, counselor, administrator Diana Browning Wright, M.S., L.E.P. 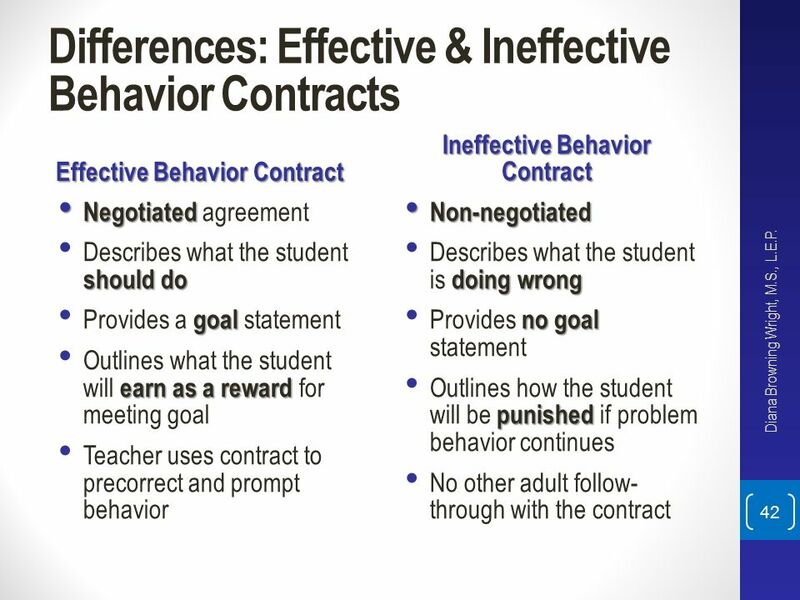 Negotiated agreement Describes what the student should do Provides a goal statement Outlines what the student will earn as a reward for meeting goal Teacher uses contract to precorrect and prompt behavior Non-negotiated Describes what the student is doing wrong Provides no goal statement Outlines how the student will be punished if problem behavior continues No other adult follow- through with the contract Diana Browning Wright, M.S., L.E.P. 1. Arrange a meeting between the student and adults Who should attend the meeting: Parent(s), teacher, behavioral specialist, counselor, administrator Purpose of the meeting: Not to condemn, reprimand, or remind the student of the wrongs in his way of behaving “We are here because things aren’t working for you or us, so we want to make a deal with you. You have something we want, and we have stuff that you want.” Diana Browning Wright, M.S., L.E.P. 2. Holding the meeting to negotiate and develop the behavior contract Introductions and description of the meaning and purpose of a contract so the student has a concept and understanding of what a contract entails The introductions should not involve emphasizing what the student has done wrong, but rather that the current situation is not working for anyone and there is a need to work out a deal. The adults are willing to have the student have some say in what goes on instead of telling the student what to do It is important to make it a big deal. Describe how a contract is essentially a legally binding deal.” Are you a person of your word? Do you keep your promises? 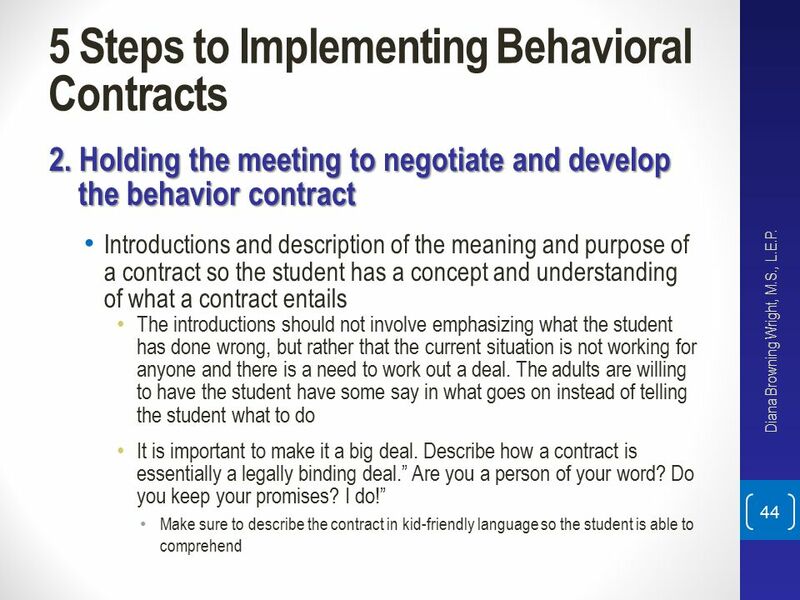 I do!” Make sure to describe the contract in kid-friendly language so the student is able to comprehend Diana Browning Wright, M.S., L.E.P. Describe the alternative appropriate behaviors or social skills you would like to see, and gather the student’s input to get him to commit to engage in 4545 those behaviors Make sure the student is actually capable of exhibiting the appropriate behaviors; therefore, the positive behavior or social skill is within the student’s repertoire and all that is needed is a motivational component that encourages the student to display the behaviors he already knows how to exhibit If the student can’t exhibit the appropriate behaviors or social skills because he has not learned them, then time will need to be devoted to teaching the student how to exhibit them using a tell-show-do instructional approach Diana Browning Wright, M.S., L.E.P. Help the student identify rewards, activities, or privileges to be earned if he is able to hold up his end of the bargain by meeting the goal This should be student-driven in that the student selects preferred items, activities or rewards that he will earn based on good behavior An important consideration is how frequently should the reinforcer or reward be earned? A good rule of thumb is to gauge how the long the student can actually delay gratification. This entails considering how the far the student can look into the future and wait. If the student can only think a day at a time, then he should be able to earn the reinforcer or reward on a daily basis. Generally, the younger the student, the more frequent they will need to be able to earn the reinforcer or reward. Diana Browning Wright, M.S., L.E.P. 3. 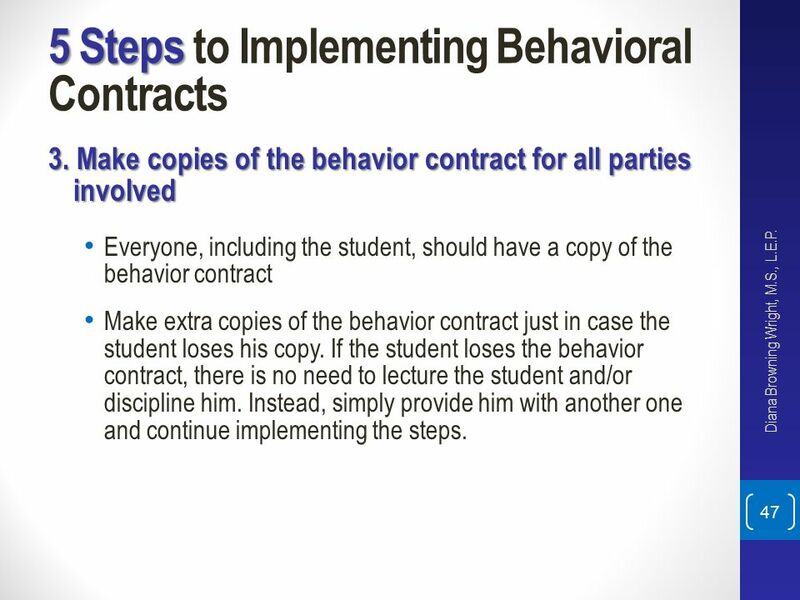 Make copies of the behavior contract for all parties involved Everyone, including the student, should have a copy of the behavior contract Make extra copies of the behavior contract just in case the student loses his copy. 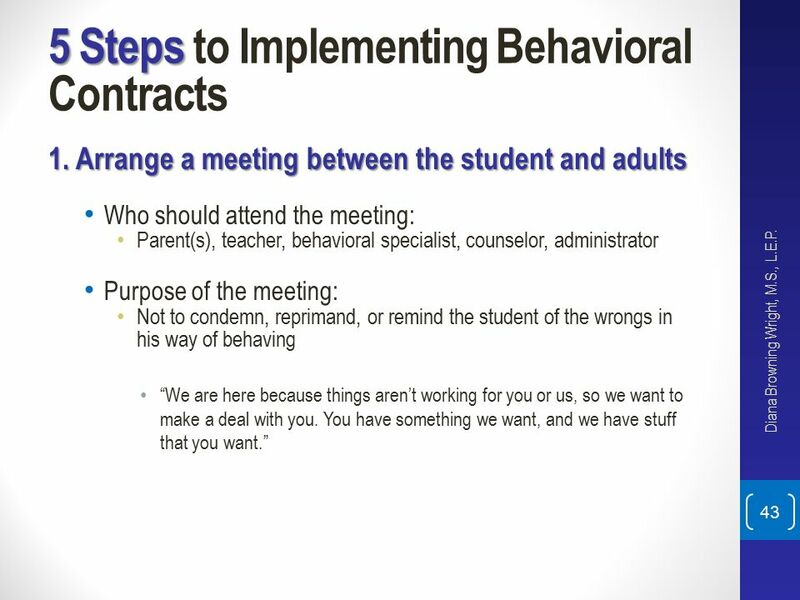 If the student loses the behavior contract, there is no need to lecture the student and/or discipline him. Instead, simply provide him with another one and continue implementing the steps. Diana Browning Wright, M.S., L.E.P. 4. 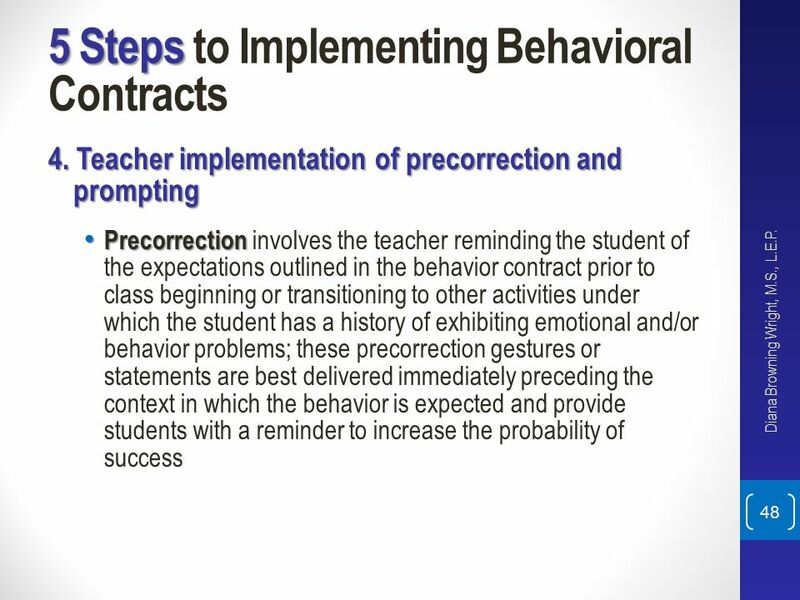 Teacher implementation of precorrection and prompting Precorrection involves the teacher reminding the student of the expectations outlined in the behavior contract prior to class beginning or transitioning to other activities under which the student has a history of exhibiting emotional and/or behavior problems; these precorrection gestures or statements are best delivered immediately preceding the context in which the behavior is expected and provide students with a reminder to increase the probability of success Diana Browning Wright, M.S., L.E.P. 4. 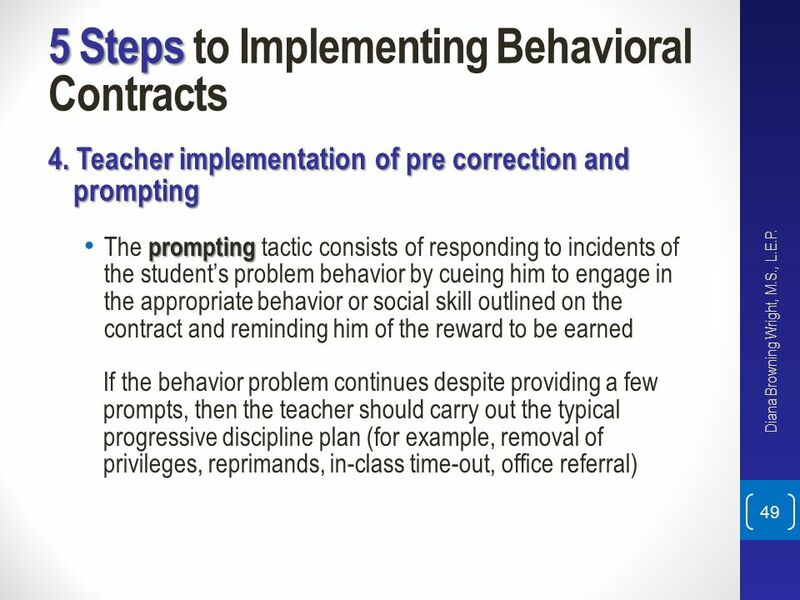 Teacher implementation of pre correction and prompting The prompting tactic consists of responding to incidents of the student’s problem behavior by cueing him to engage in the appropriate behavior or social skill outlined on the contract and reminding him of the reward to be earned If the behavior problem continues despite providing a few prompts, then the teacher should carry out the typical progressive discipline plan (for example, removal of privileges, reprimands, in-class time-out, office referral) Diana Browning Wright, M.S., L.E.P. 5. 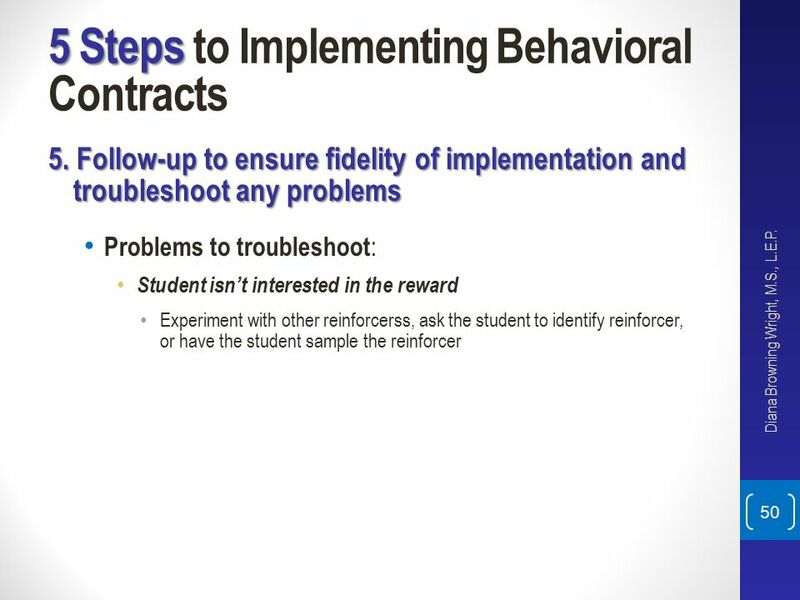 Follow-up to ensure fidelity of implementation and troubleshoot any problems Problems to troubleshoot: Student isn’t interested in the reward Experiment with other reinforcerss, ask the student to identify reinforcer, or have the student sample the reinforcer Diana Browning Wright, M.S., L.E.P. 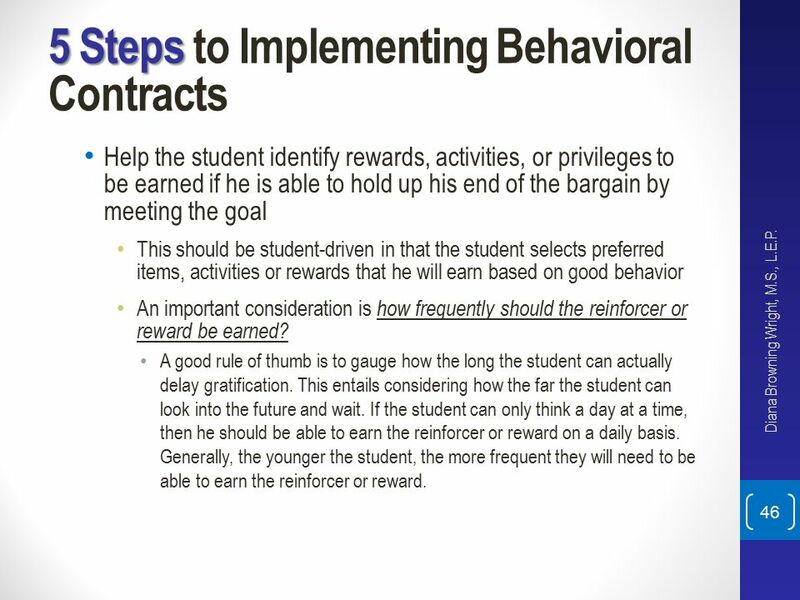 Student has to wait too long to get access to reinforcer (pay off) Allow the student to access reinforcers in shorter periods of time or deliver tokens that can be periodically given and exchanged for desired items/privileges Teacher does not implement precorrection and prompting Performance-based feedback Diana Browning Wright, M.S., L.E.P. Check in/Check Out Check, Connect, and Expect Check and Connect Assignment of adult mentor who provides unconditional positive regard and feedback Multiple behavioral components: Behavioral momentum Precorrection Performance feedback Positive reinforcement Goal specification and attainment Diana Browning Wright, M.S., L.E.P. 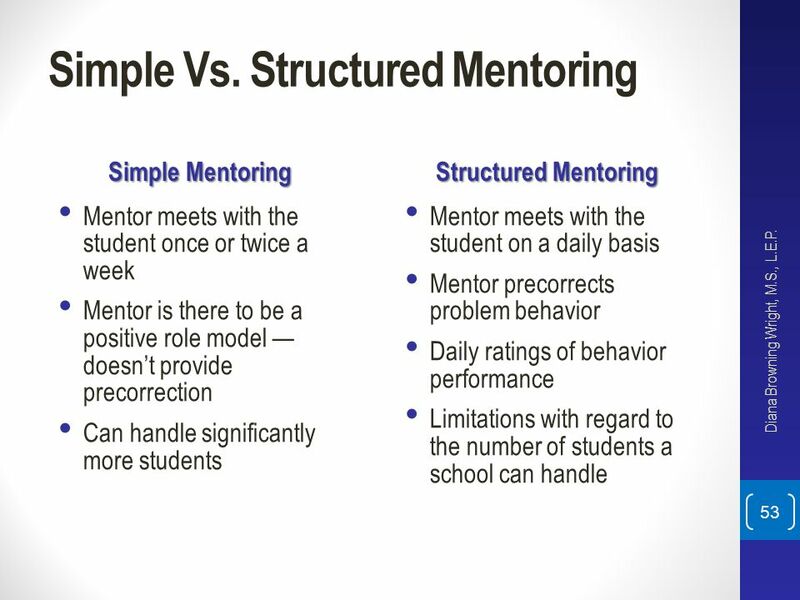 Simple Mentoring Structured Mentoring Mentor meets with the student once or twice a week Mentor is there to be a positive role model — doesn’t provide precorrection Can handle significantly more students Mentor meets with the student on a daily basis Mentor precorrects problem behavior Daily ratings of behavior performance Limitations with regard to the number of students a school can handle Diana Browning Wright, M.S., L.E.P. 1. Check In 2. Teacher Feedback by Period Positive greeting Check for school readiness Cutoff problems before Reminder of expected behaviors Talk about reward to be earned Give student monitoring chart Teacher monitoring Prompts to engage in expected behavior Reminder of reward to be earned Non-emotional feedback Diana Browning Wright, M.S., L.E.P. 3. Check Out 4. Parent feedback Positive greeting Deliver praise/reward Provide nonjudgmental feedback Allow student to tabulate results Deliver consequences at home based on behavior at school Provide encouragement for a better day tomorrow, or, Celebrate success Diana Browning Wright, M.S., L.E.P. Todd, A.W., Campbell, A.L., Meyer, G.G., & Horner, R.H. (2008). The effects of a targeted intervention to reduce problem behaviors: Elementary school implementation of Check in-Check out. Journal of Positive Behavior Interventions, 10, Hawken, L.S., MacLeod, K.S., & Rawlings, L. (2007). 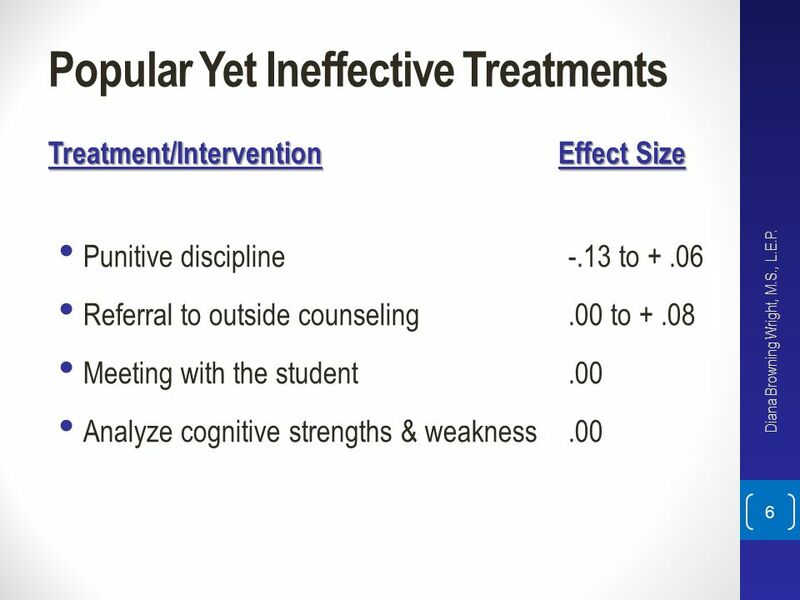 Effects of the Behavior Education Program on office discipline referrals of elementary school students. 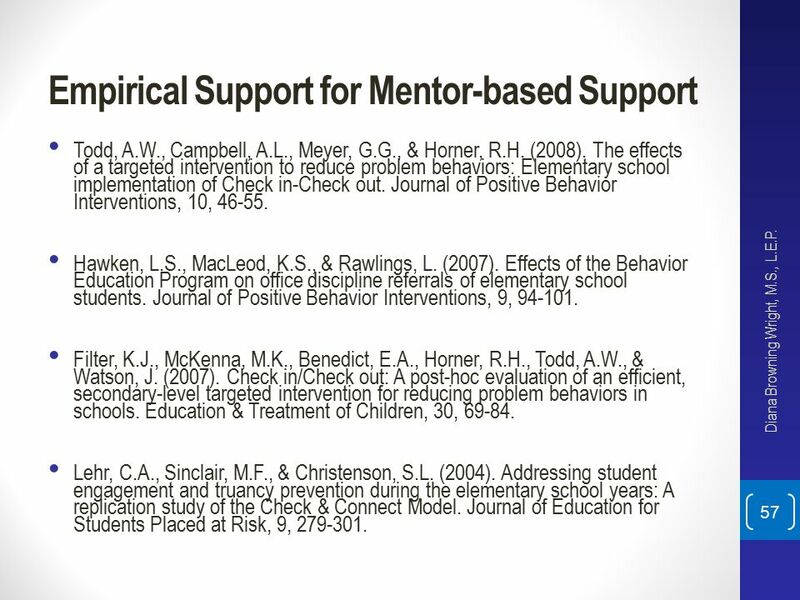 Journal of Positive Behavior Interventions, 9, Filter, K.J., McKenna, M.K., Benedict, E.A., Horner, R.H., Todd, A.W., & Watson, J. (2007). 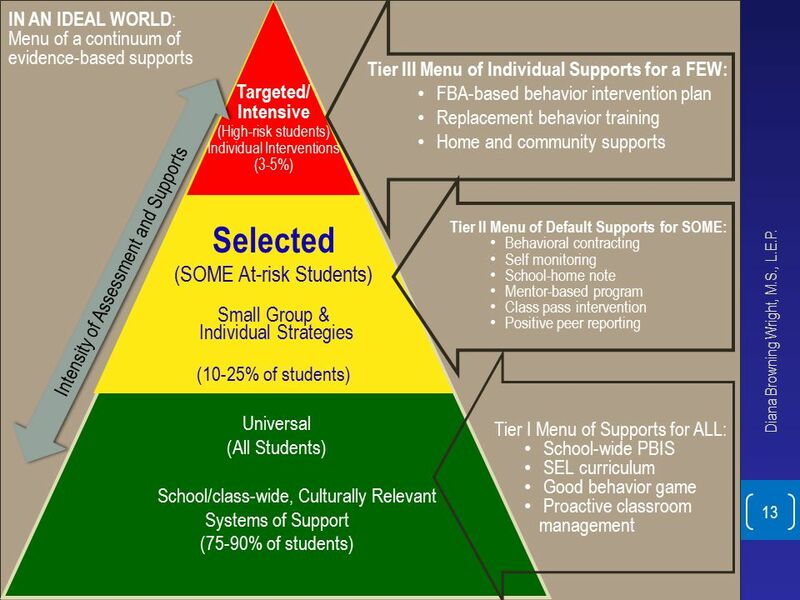 Check in/Check out: A post-hoc evaluation of an efficient, secondary-level targeted intervention for reducing problem behaviors in schools. Education & Treatment of Children, 30, Lehr, C.A., Sinclair, M.F., & Christenson, S.L. (2004). Addressing student engagement and truancy prevention during the elementary school years: A replication study of the Check & Connect Model. Journal of Education for Students Placed at Risk, 9, Diana Browning Wright, M.S., L.E.P. 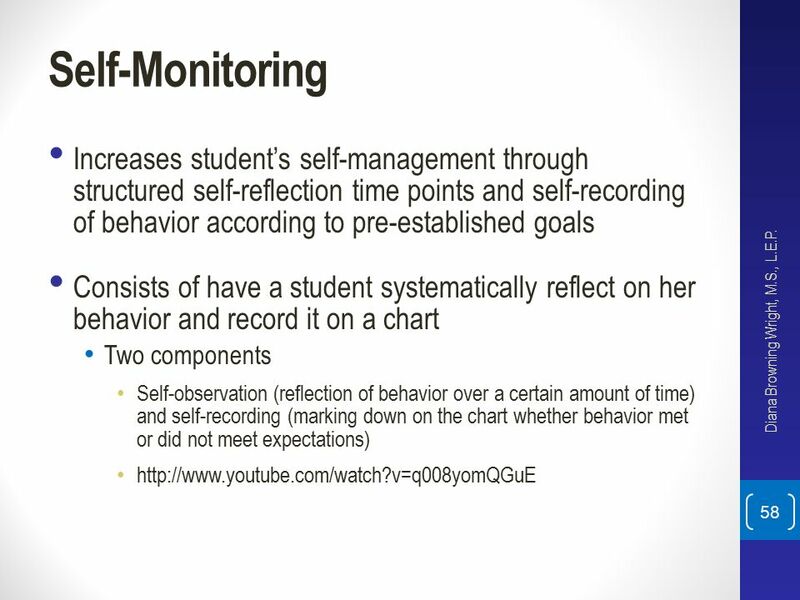 58 Self-Monitoring Increases student’s self-management through structured self-reflection time points and self-recording of behavior according to pre-established goals Consists of have a student systematically reflect on her behavior and record it on a chart Two components Self-observation (reflection of behavior over a certain amount of time) and self-recording (marking down on the chart whether behavior met or did not meet expectations) Diana Browning Wright, M.S., L.E.P. 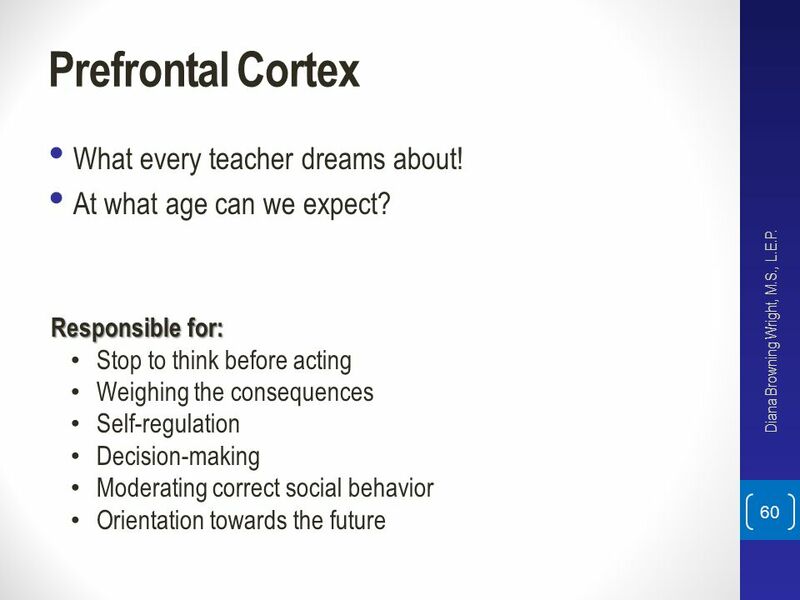 60 Prefrontal Cortex What every teacher dreams about! Students with behavior problems have deficits in self- management Embeds prompts and cues for self-reflection Increases their awareness of their behaviors and the consequences associated with them Enhances self-regulatory behaviors by activating pre- frontal cortex Students are reinforced for engaging in expected behaviors, which allows them to learn and make the connection between appropriate behavior and positive outcomes Diana Browning Wright, M.S., L.E.P. 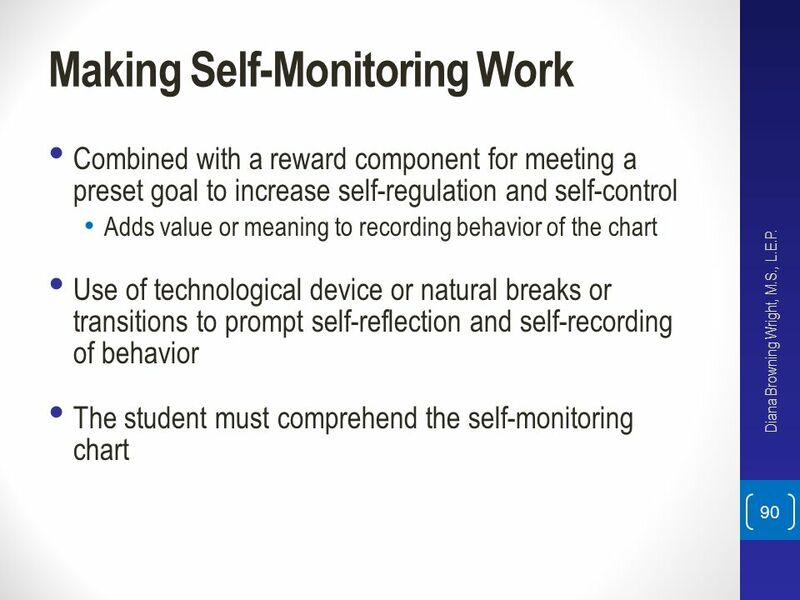 Combined with a reward component for meeting a preset goal to increase self-regulation and self-control Adds value or meaning to recording behavior of the chart Use of technological device or natural breaks or transitions to prompt self-reflection and self-recording of behavior The student must comprehend the self-monitoring chart Diana Browning Wright, M.S., L.E.P. Rest assured that teachers find this intervention to be the most acceptable Tier II intervention Enhances independence and self-reliance Little teacher time Viewed as more ethical and acceptable than other approaches Diana Browning Wright, M.S., L.E.P. 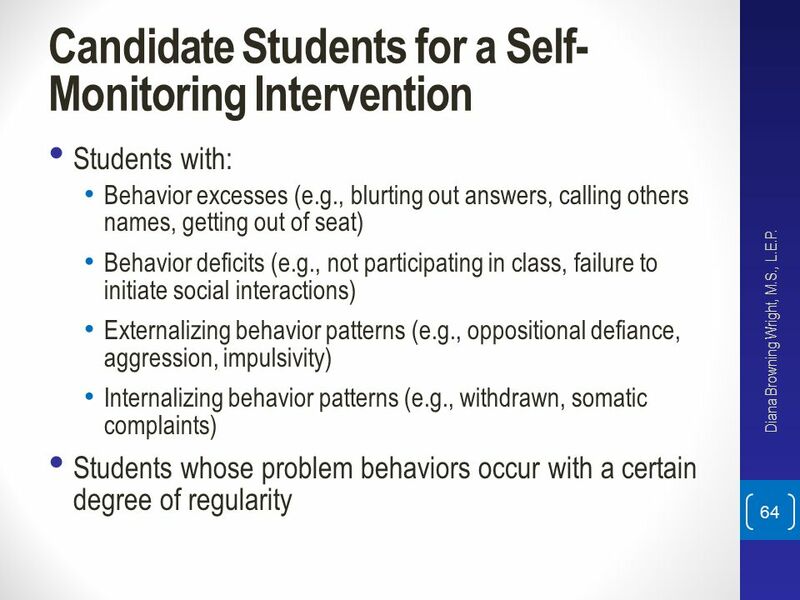 Students with: Behavior excesses (e.g., blurting out answers, calling others names, getting out of seat) Behavior deficits (e.g., not participating in class, failure to initiate social interactions) Externalizing behavior patterns (e.g., oppositional defiance, aggression, impulsivity) Internalizing behavior patterns (e.g., withdrawn, somatic complaints) Students whose problem behaviors occur with a certain degree of regularity Diana Browning Wright, M.S., L.E.P. 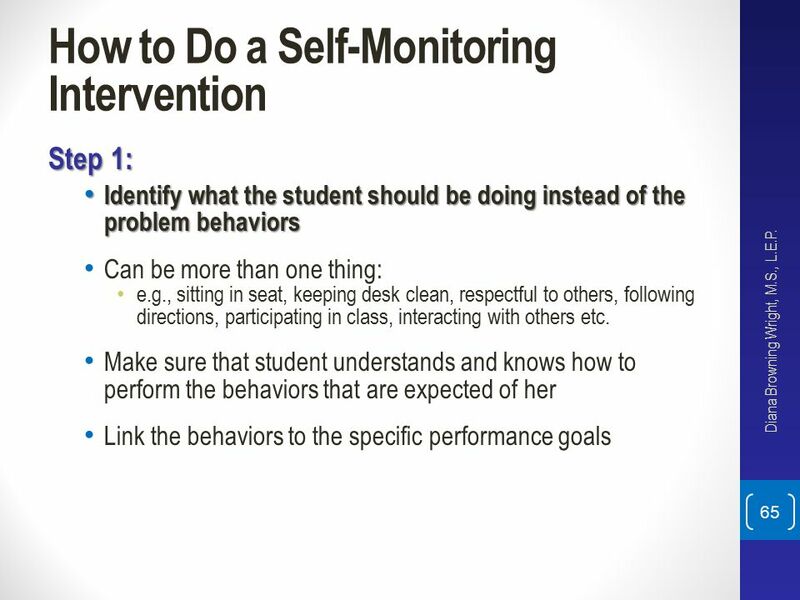 Step 1: Identify what the student should be doing instead of the problem behaviors Can be more than one thing: e.g., sitting in seat, keeping desk clean, respectful to others, following directions, participating in class, interacting with others etc. 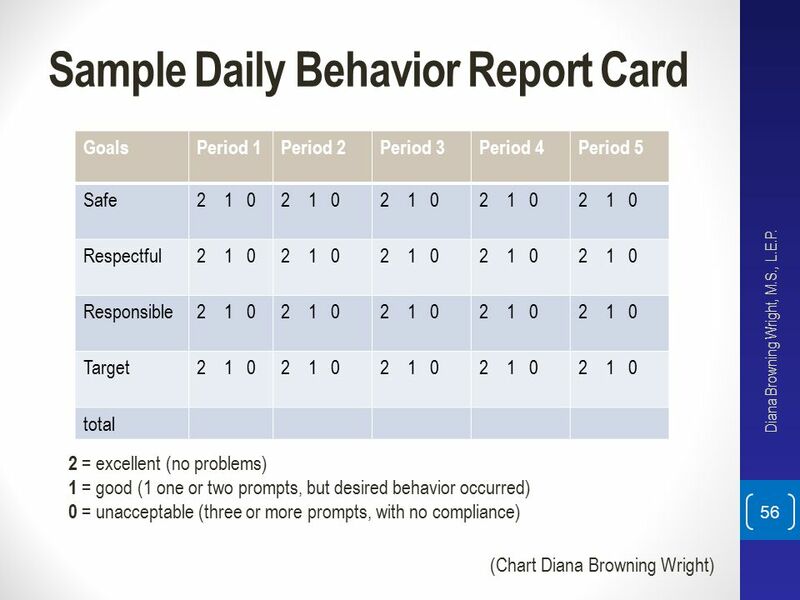 Make sure that student understands and knows how to perform the behaviors that are expected of her Link the behaviors to the specific performance goals Diana Browning Wright, M.S., L.E.P. 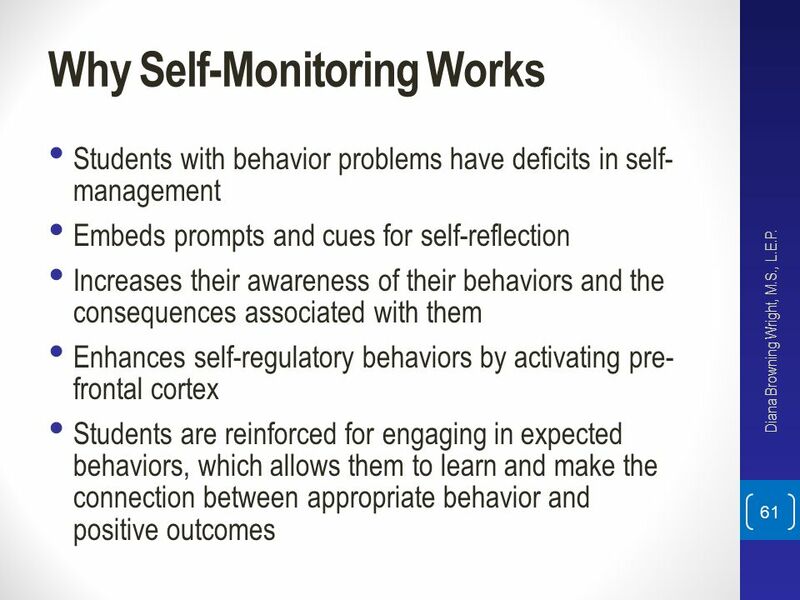 Step 2: Determine how frequently the student will self-monitor and record her behaviors Rule of thumb is the more times the problem behavior occurs, the more frequently students need to self-monitor Can have student self-monitor once every five minutes, at every natural break during the day, or twice daily (e.g., once before lunch and once at the end of the day) Diana Browning Wright, M.S., L.E.P. 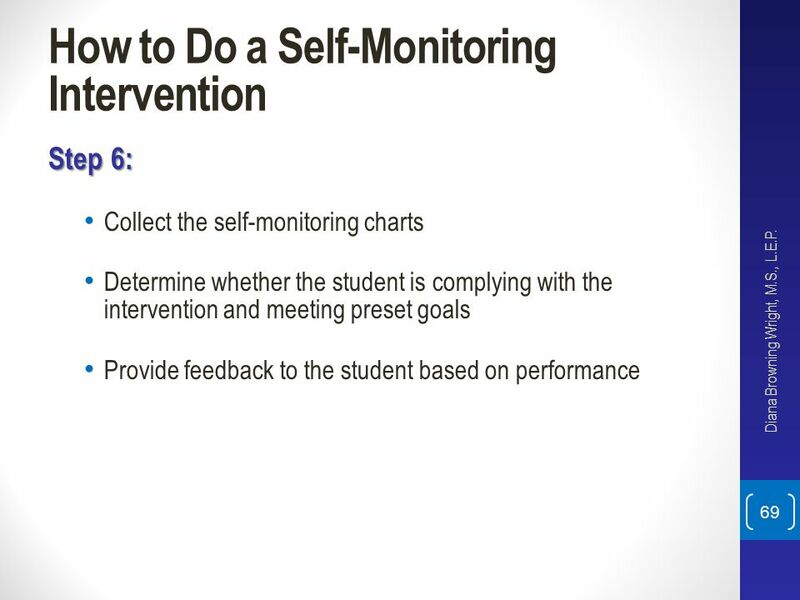 Step 3: Develop self-monitoring chart and decide how student will be prompted to self-monitor Have natural breaks in the class (e.g., recess, lunch, transition to library) prompt student to self-monitor Use of vibrating watches or clocks to trigger student to self-monitor Computer software Step 4: Develop a goal with the student, and identify the reinforcers the student will earn if the goal is met This will make the chart take on value and become a currency that can be exchanged for desirable goods Diana Browning Wright, M.S., L.E.P. 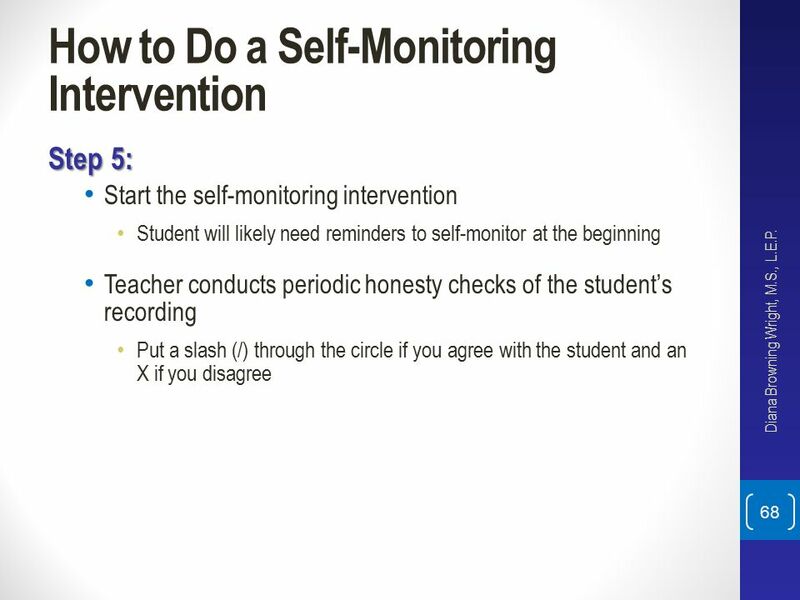 Step 5: Start the self-monitoring intervention Student will likely need reminders to self-monitor at the beginning Teacher conducts periodic honesty checks of the student’s recording Put a slash (/) through the circle if you agree with the student and an X if you disagree Diana Browning Wright, M.S., L.E.P. 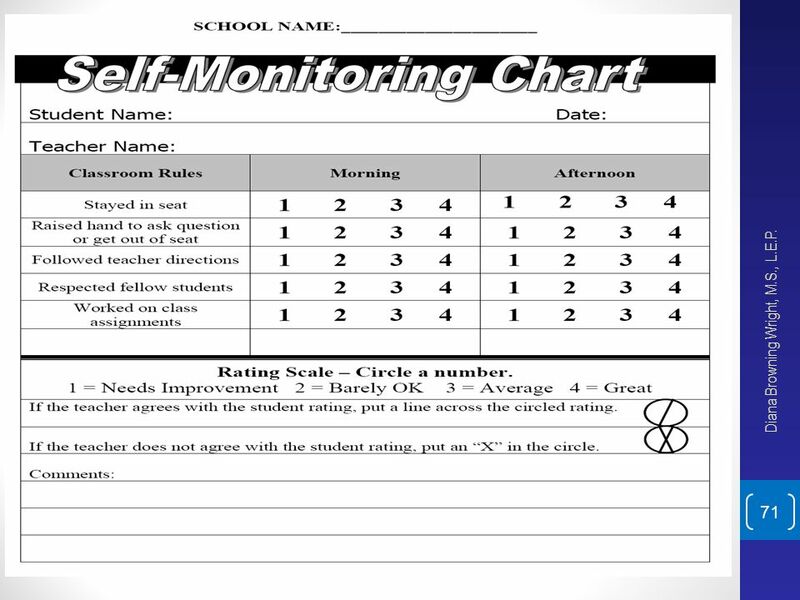 Step 6: Collect the self-monitoring charts Determine whether the student is complying with the intervention and meeting preset goals Provide feedback to the student based on performance Diana Browning Wright, M.S., L.E.P. 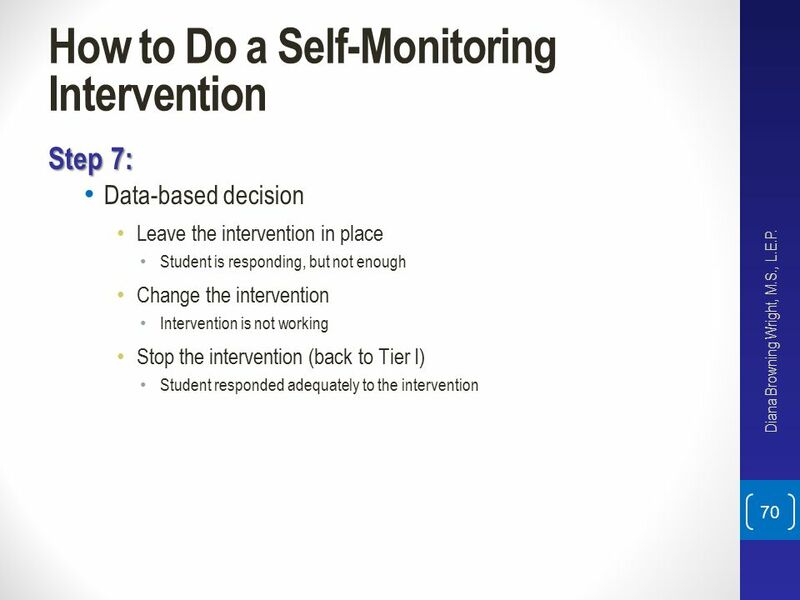 Step 7: Data-based decision Leave the intervention in place Student is responding, but not enough Change the intervention Intervention is not working Stop the intervention (back to Tier I) Student responded adequately to the intervention Diana Browning Wright, M.S., L.E.P. 71 Diana Browning Wright, M.S., L.E.P. 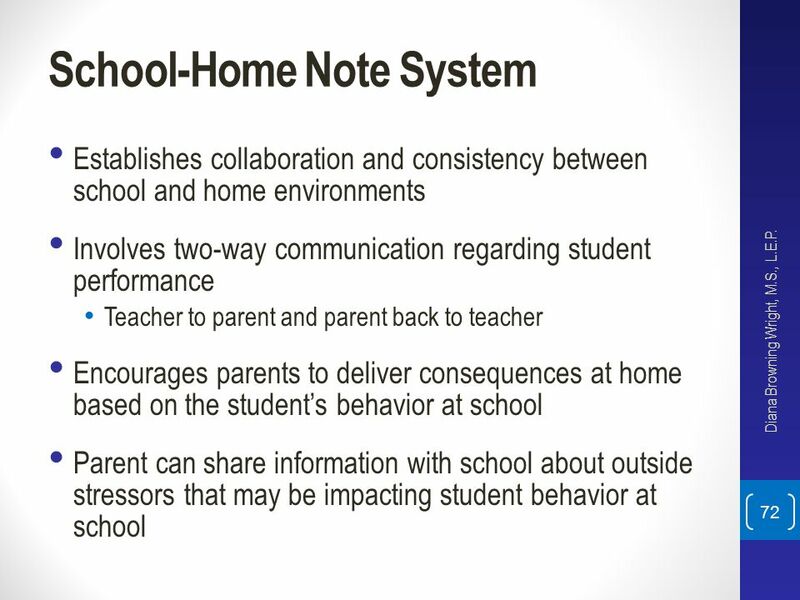 Establishes collaboration and consistency between school and home environments Involves two-way communication regarding student performance Teacher to parent and parent back to teacher Encourages parents to deliver consequences at home based on the student’s behavior at school Parent can share information with school about outside stressors that may be impacting student behavior at school Diana Browning Wright, M.S., L.E.P. 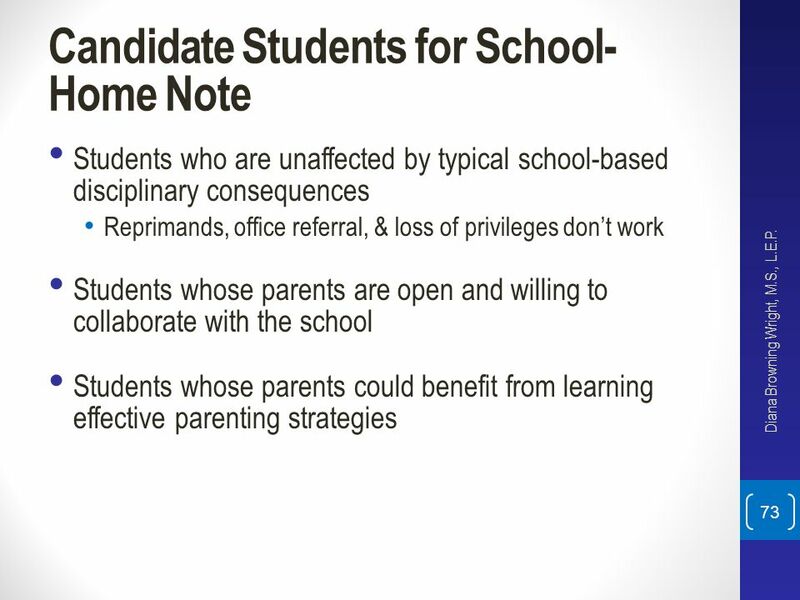 Students who are unaffected by typical school-based disciplinary consequences Reprimands, office referral, & loss of privileges don’t work Students whose parents are open and willing to collaborate with the school Students whose parents could benefit from learning effective parenting strategies Diana Browning Wright, M.S., L.E.P. Celebrating the student’s success (aim is to create positive contrast by making the student’s life more exciting, pleasurable, and/or fun) Access to privileges Computer time, video games, talking on the phone, staying up later, hanging out with friends, TV time Reward with item or activity Buy-out of chore, money, invite friend over, play outside, after-dinner dessert, playing with toys, etc. Praise and positive recognition Diana Browning Wright, M.S., L.E.P. 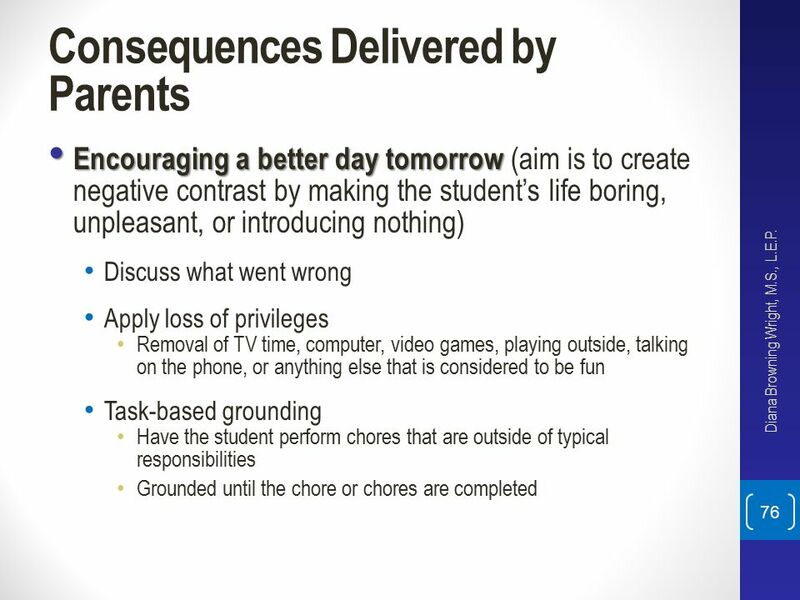 Encouraging a better day tomorrow (aim is to create negative contrast by making the student’s life boring, unpleasant, or introducing nothing) Discuss what went wrong Apply loss of privileges Removal of TV time, computer, video games, playing outside, talking on the phone, or anything else that is considered to be fun Task-based grounding Have the student perform chores that are outside of typical responsibilities Grounded until the chore or chores are completed Diana Browning Wright, M.S., L.E.P. 77 Diana Browning Wright, M.S., L.E.P. 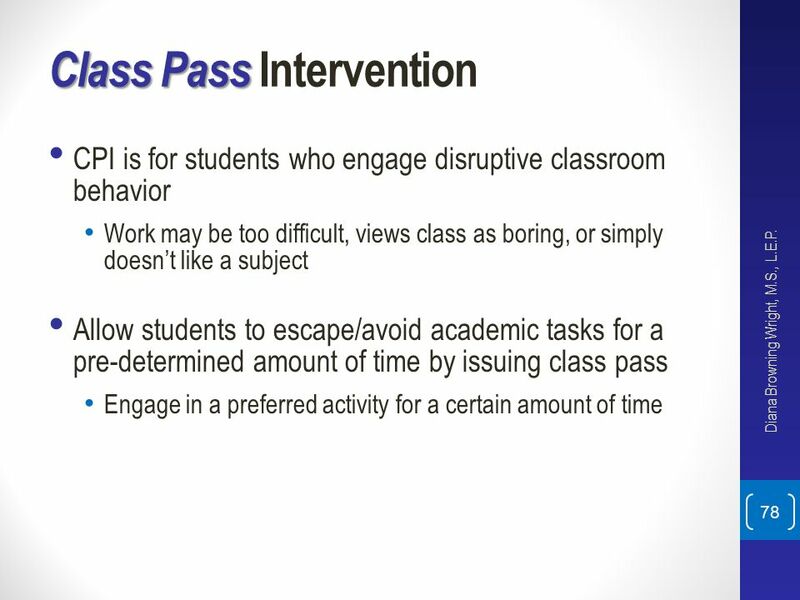 CPI is for students who engage disruptive classroom behavior Work may be too difficult, views class as boring, or simply doesn’t like a subject Allow students to escape/avoid academic tasks for a pre-determined amount of time by issuing class pass Engage in a preferred activity for a certain amount of time Diana Browning Wright, M.S., L.E.P. 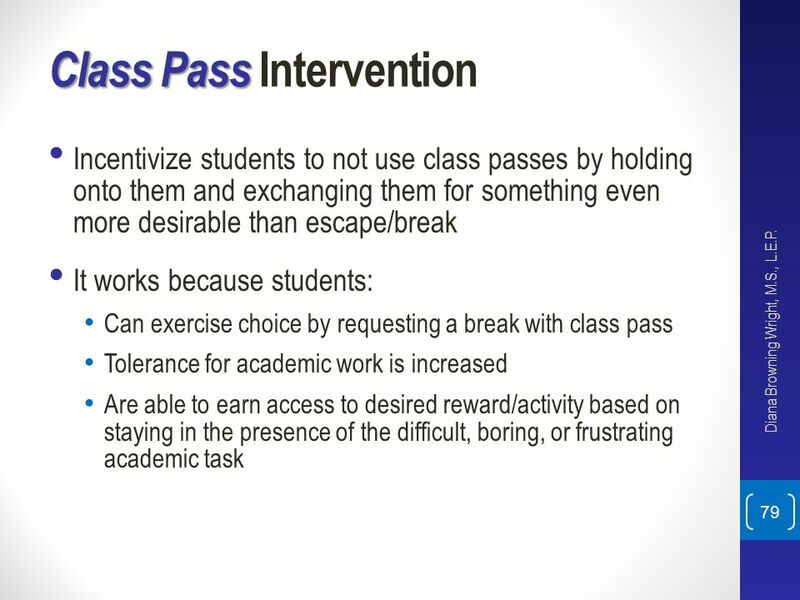 Incentivize students to not use class passes by holding onto them and exchanging them for something even more desirable than escape/break It works because students: Can exercise choice by requesting a break with class pass Tolerance for academic work is increased Are able to earn access to desired reward/activity based on staying in the presence of the difficult, boring, or frustrating academic task Diana Browning Wright, M.S., L.E.P. 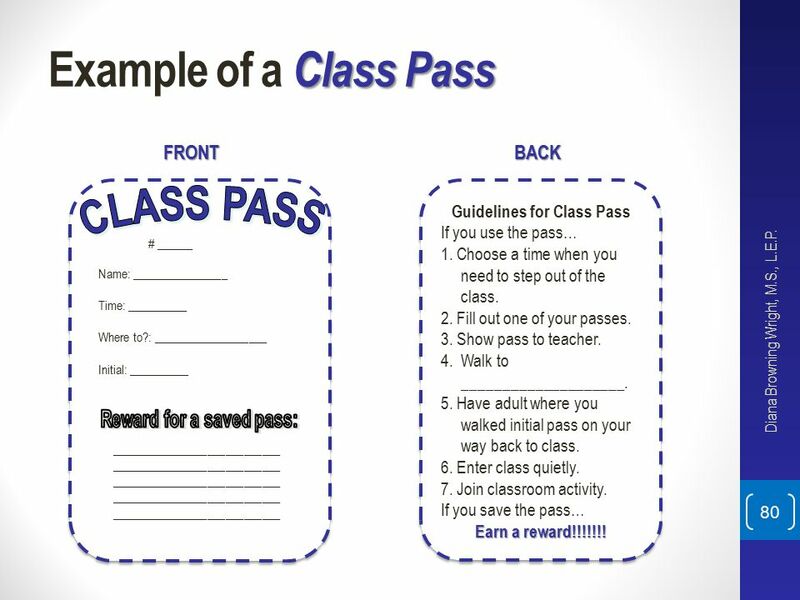 Meet with the student to teach them the CPI and how to appropriately request a break using the class pass Identify a spot where the student can break and engage in a preferred activity for 3 to 7 minutes (this depends on how long staff are willing to accept) Determine the rewards and/or privileges that can be earned by saving the class passes (make it such that the more passes means the better the reward and/or privilege) Diana Browning Wright, M.S., L.E.P. 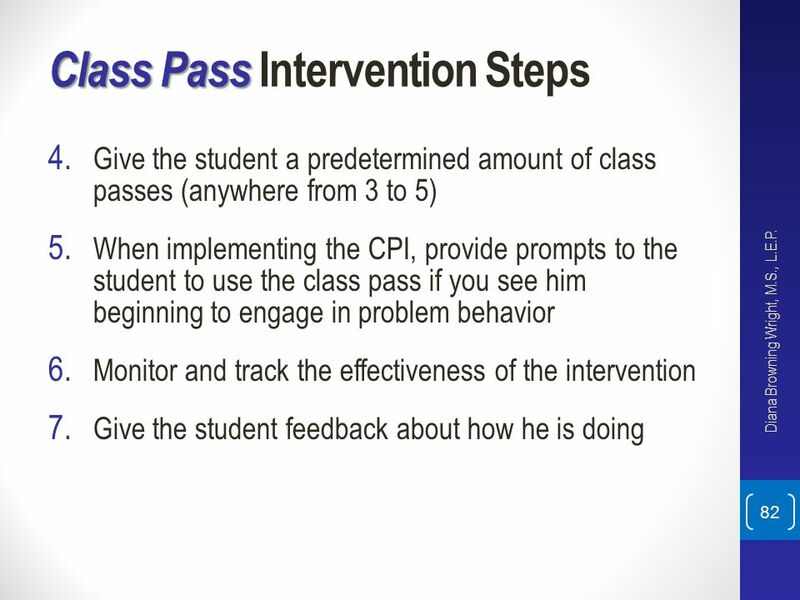 Give the student a predetermined amount of class passes (anywhere from 3 to 5) When implementing the CPI, provide prompts to the student to use the class pass if you see him beginning to engage in problem behavior Monitor and track the effectiveness of the intervention Give the student feedback about how he is doing Diana Browning Wright, M.S., L.E.P. 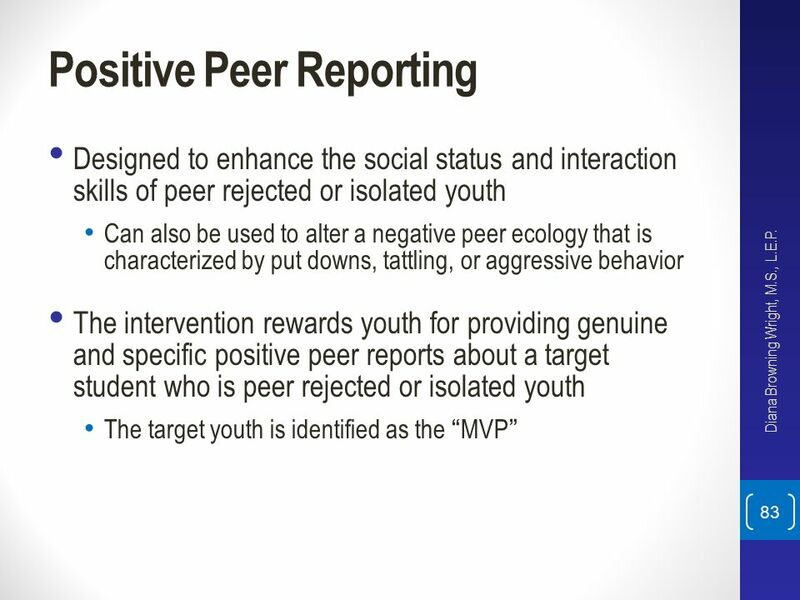 Designed to enhance the social status and interaction skills of peer rejected or isolated youth Can also be used to alter a negative peer ecology that is characterized by put downs, tattling, or aggressive behavior The intervention rewards youth for providing genuine and specific positive peer reports about a target student who is peer rejected or isolated youth The target youth is identified as the “MVP” Diana Browning Wright, M.S., L.E.P. 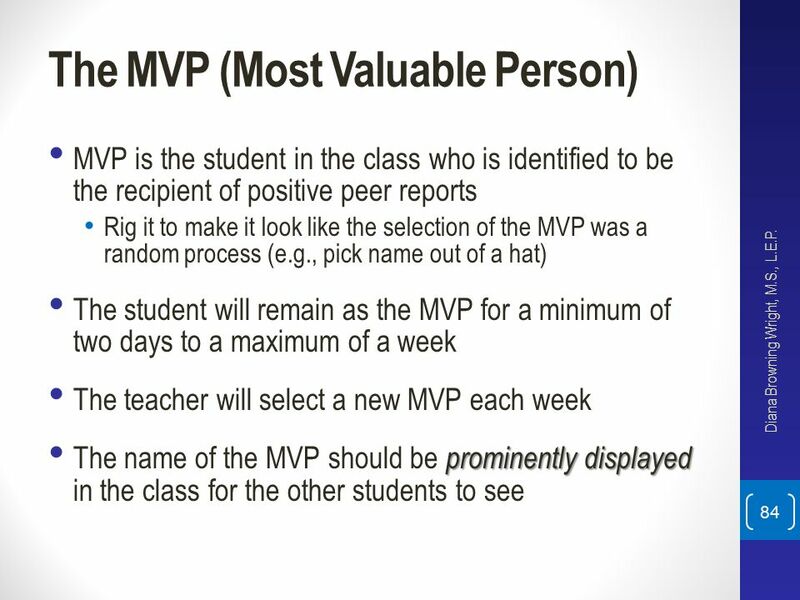 MVP is the student in the class who is identified to be the recipient of positive peer reports Rig it to make it look like the selection of the MVP was a random process (e.g., pick name out of a hat) The student will remain as the MVP for a minimum of two days to a maximum of a week The teacher will select a new MVP each week The name of the MVP should be prominently displayed in the class for the other students to see Diana Browning Wright, M.S., L.E.P. 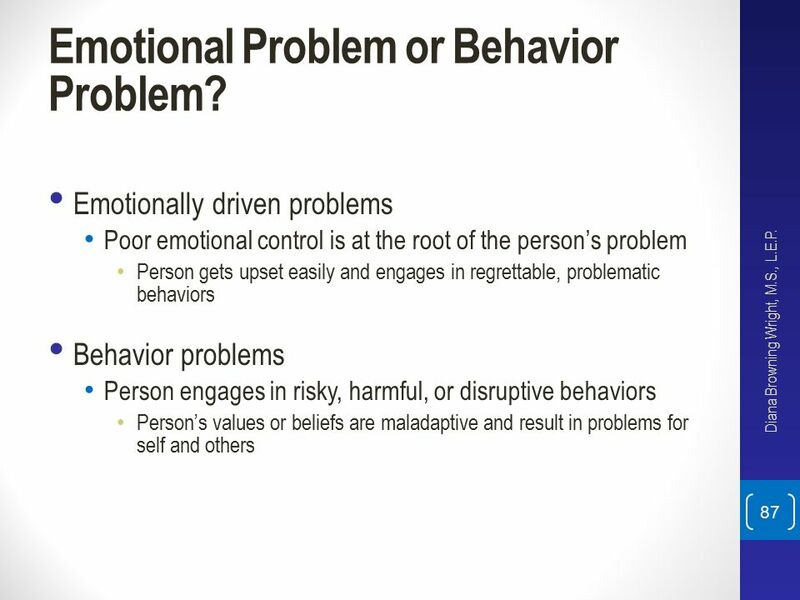 87 Emotional Problem or Behavior Problem? Emotionally driven problems Poor emotional control is at the root of the person’s problem Person gets upset easily and engages in regrettable, problematic behaviors Behavior problems Person engages in risky, harmful, or disruptive behaviors Person’s values or beliefs are maladaptive and result in problems for self and others Diana Browning Wright, M.S., L.E.P. 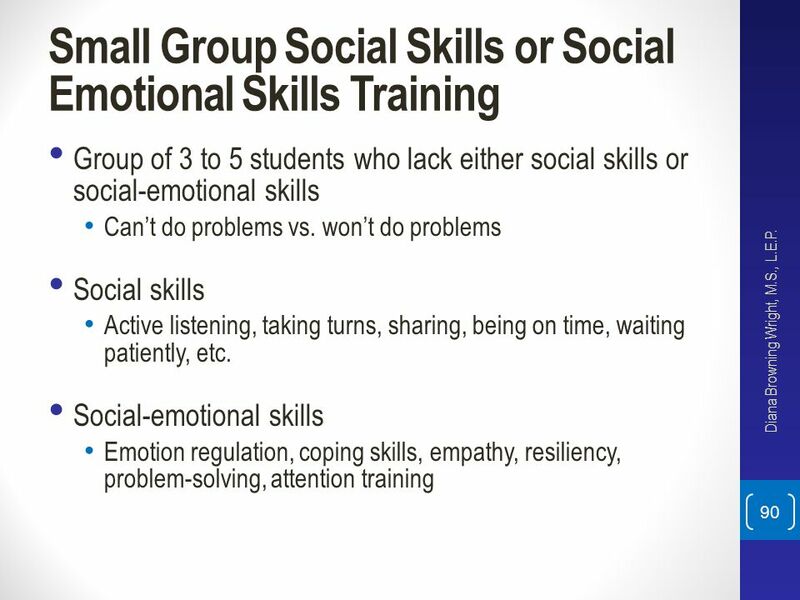 Group of 3 to 5 students who lack either social skills or social-emotional skills Can’t do problems vs. won’t do problems Social skills Active listening, taking turns, sharing, being on time, waiting patiently, etc. 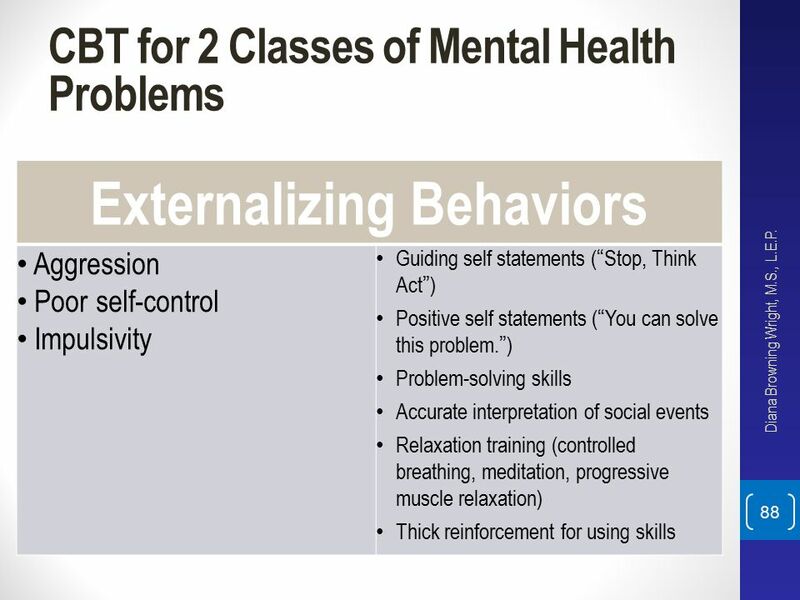 Social-emotional skills Emotion regulation, coping skills, empathy, resiliency, problem-solving, attention training Diana Browning Wright, M.S., L.E.P. 91 Thank YOU for all you do for kids! 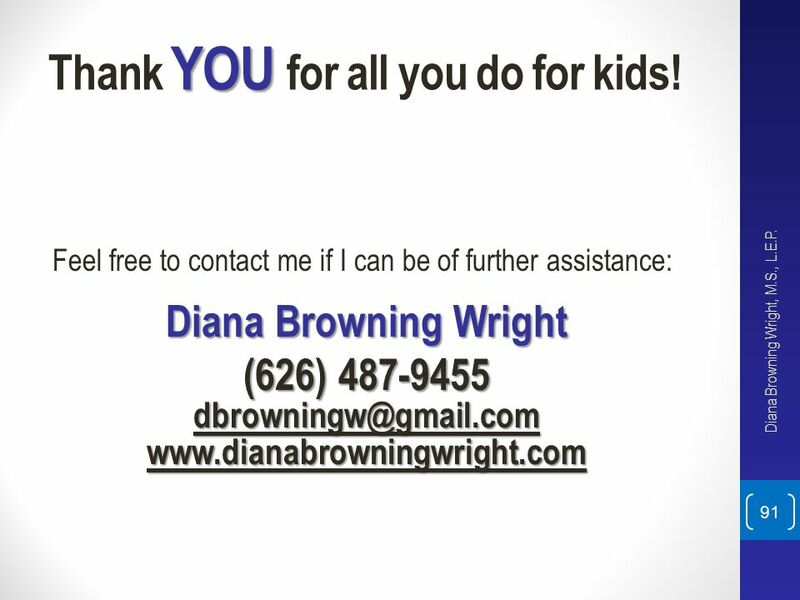 Feel free to contact me if I can be of further assistance: Diana Browning Wright (626) Diana Browning Wright, M.S., L.E.P. 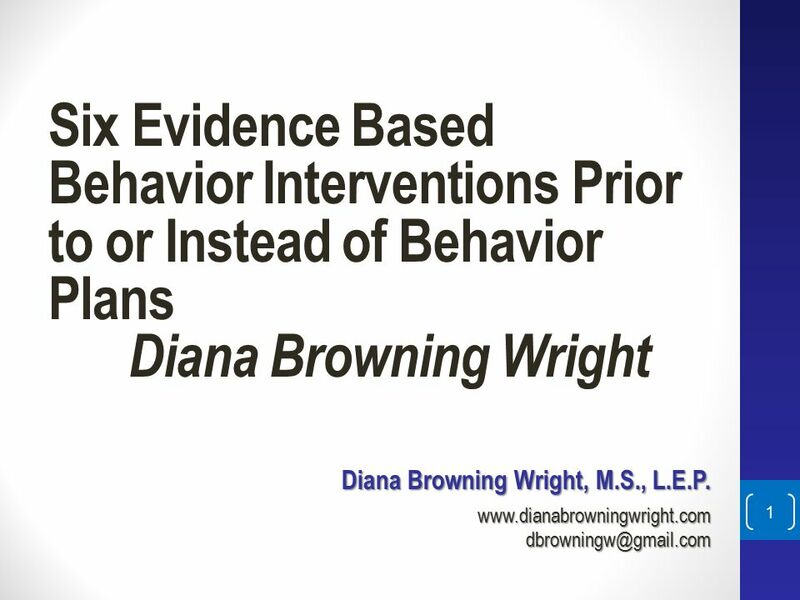 Download ppt "Six Evidence Based Behavior Interventions Prior to or Instead of Behavior Plans	Diana Browning Wright Diana Browning Wright, M.S., L.E.P. www.dianabrowningwright.com." So I wrote a behavior plan… Now What????. Data Driven Collect baseline data Use data to drive decision Limit what you are collecting data on Keep it simple. CREATING A BEHAVIOR INTERVENTION PLAN Presenters: Kyla Weatherford, LSSP; Katherine Maddox, Ph.D., LSSP; & Teressa Feierabend, LSSP. 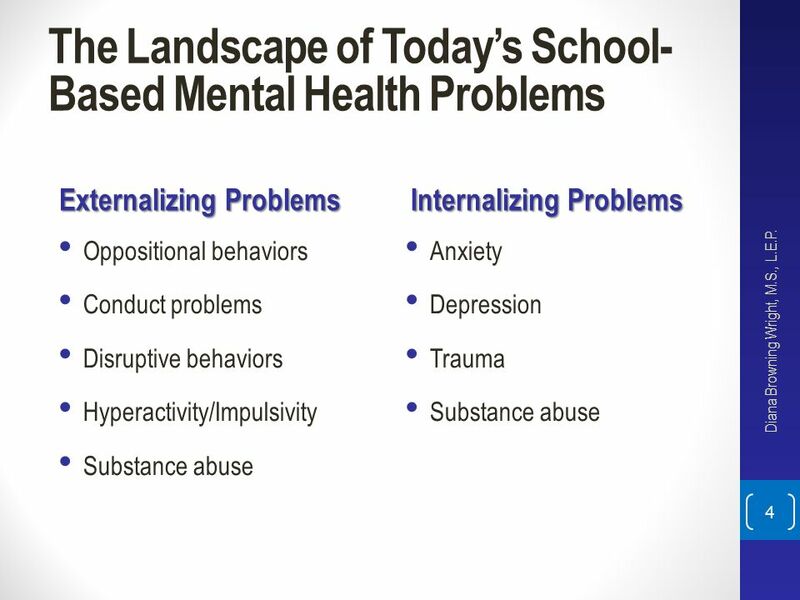 Targeted & Individual Systems of Support Lori Newcomer, Ph.D. Tim Lewis, Ph.D. University of Missouri – Columbia OSEP Center for Positive Behavior Interventions. 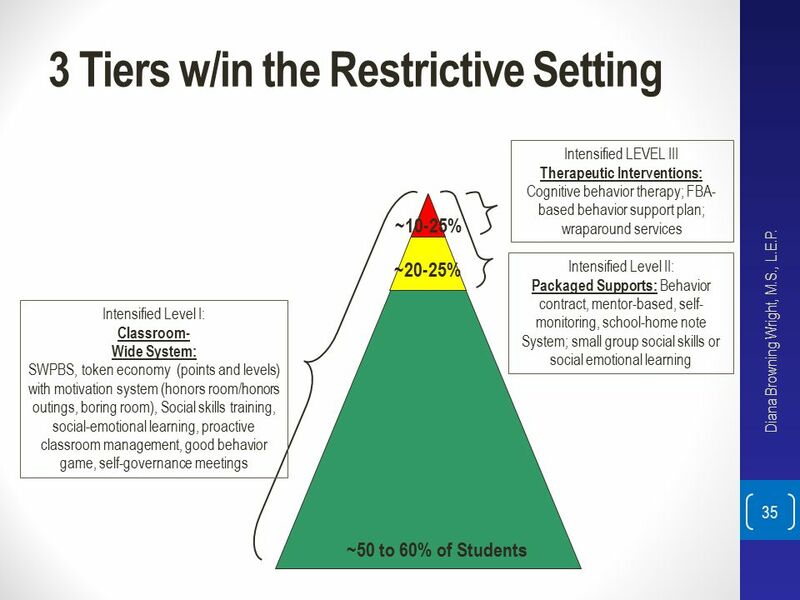 RTI Behavioral Interventions. Prevention Strategies Behavioral Expectations Classroom Space Classroom Routines Practical Schedule Instruction Study Skills. Positive And Negative Reinforcers For Your Child Psychology 121. Optional PBIS Coaches Meeting November 15, 2010 Tier 2 and Tier 3 Interventions and Supports. Course Enhancement Module on Evidence-Based Behavioral Interventions: Part 2 (Universal Behavioral Interventions in a Multi-Tiered Framework) Collaboration. WHAT IS THE CHILD TRYING TO COMMUNICATE WITH HIS BEHAVIOR? Carolina Center for ABA and Autism Treatment, Inc. 1 Treating Behavior based on Function. 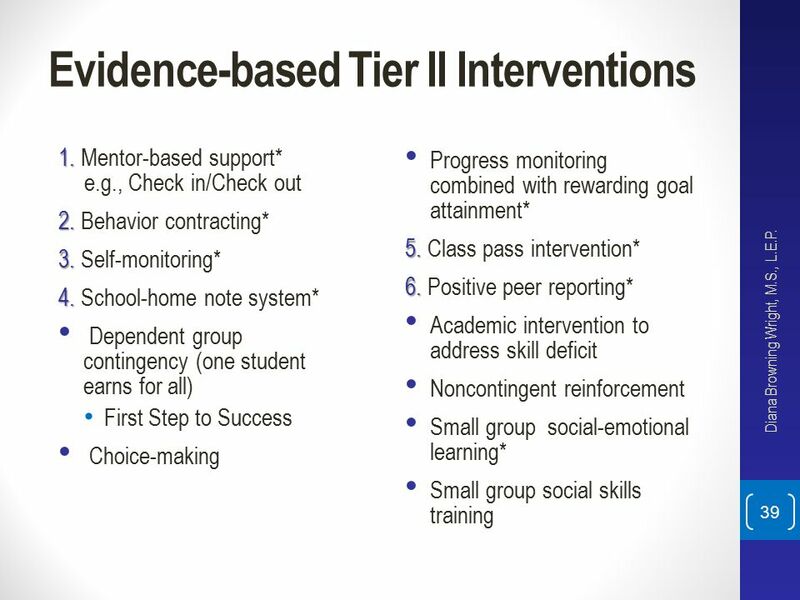 Social Skill Instruction as Tier II Intervention Tim Lewis, Ph.D. University of Missouri OSEP Center on Positive Behavioral Interventions and Supports.